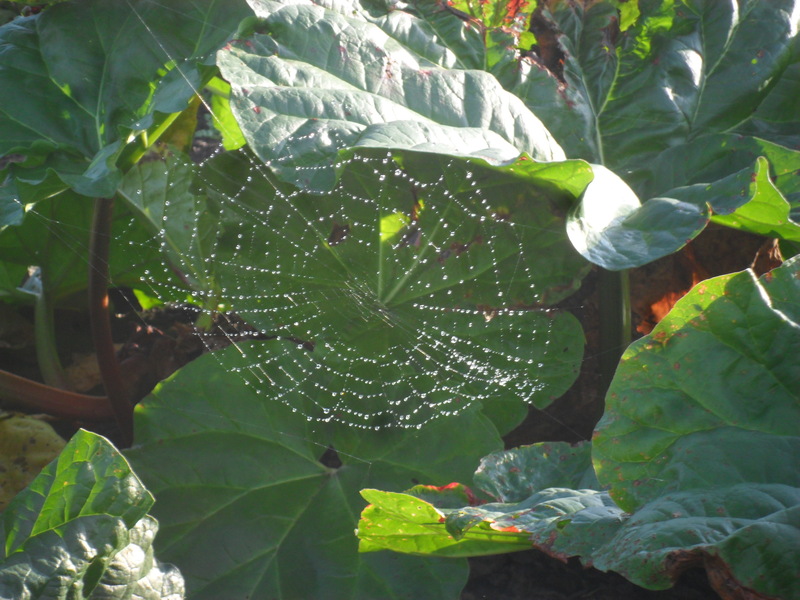 The mornings have been quite chilly this week, feeling very much like autumn is here. 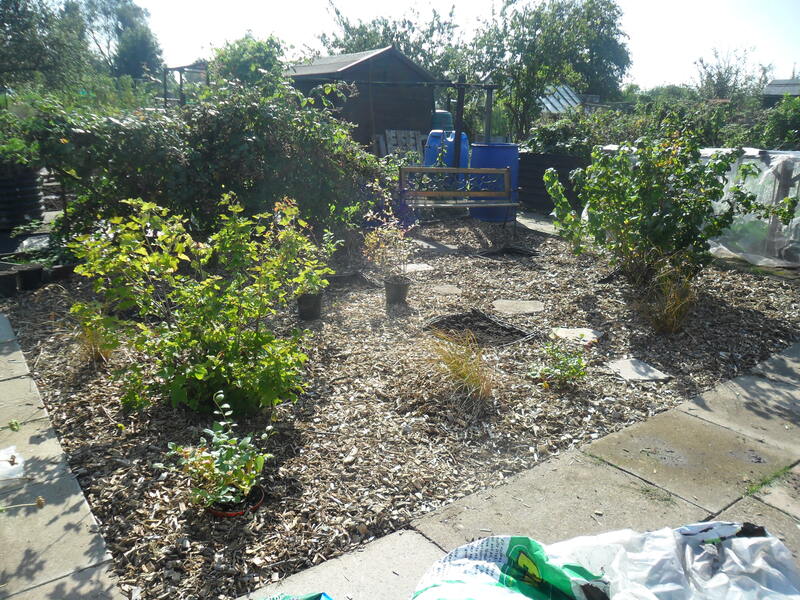 On Wednesday we had some well needed rain overnight and when the sun came out in the early morning it was a beautiful sight, with rains drops glistening around the allotment. 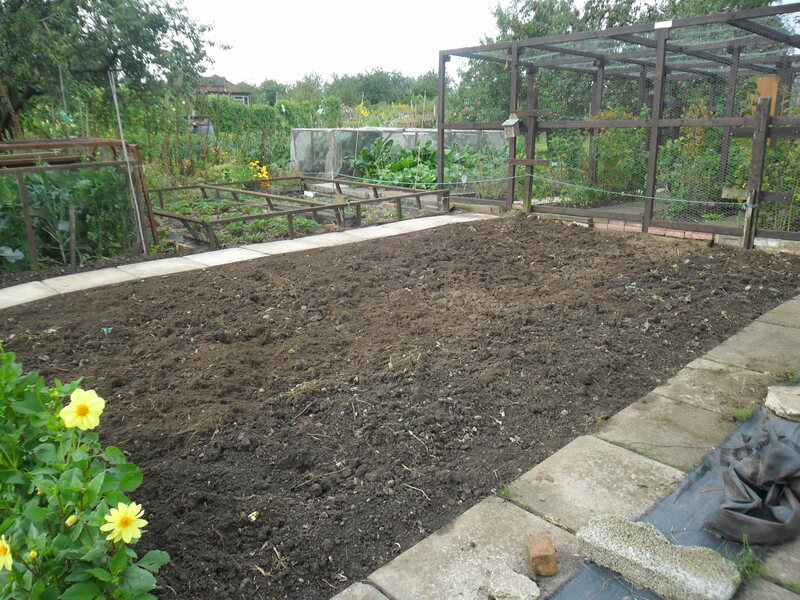 This week I have been concentrating on my polytunnel, getting it ready for winter. 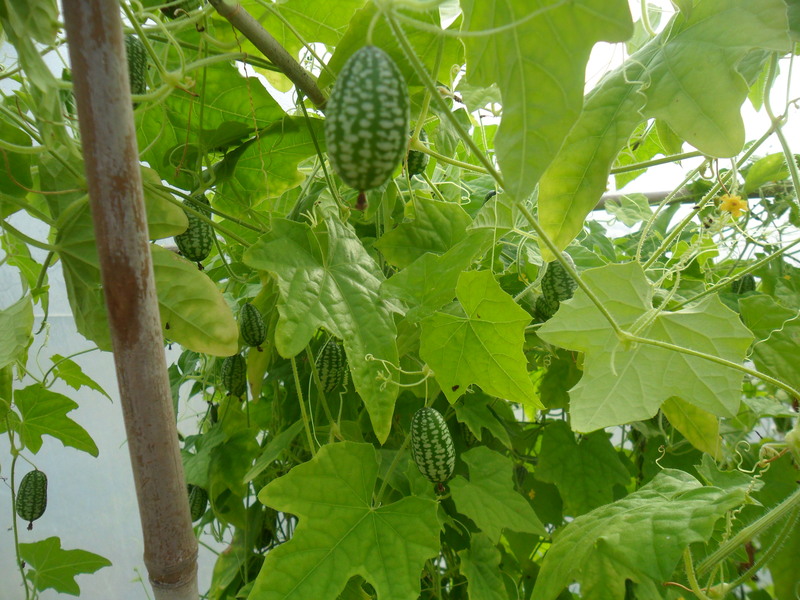 ….and I mustn’t forget the thousand ‘cucamelons’ dangling at me, ready to pick. 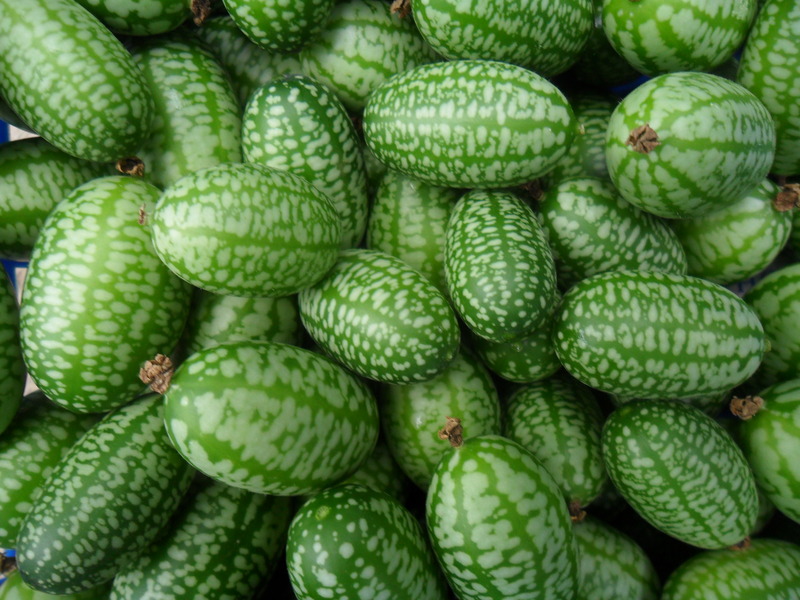 Every year I like to grow something different and this year I chose ‘cucamelons’ . 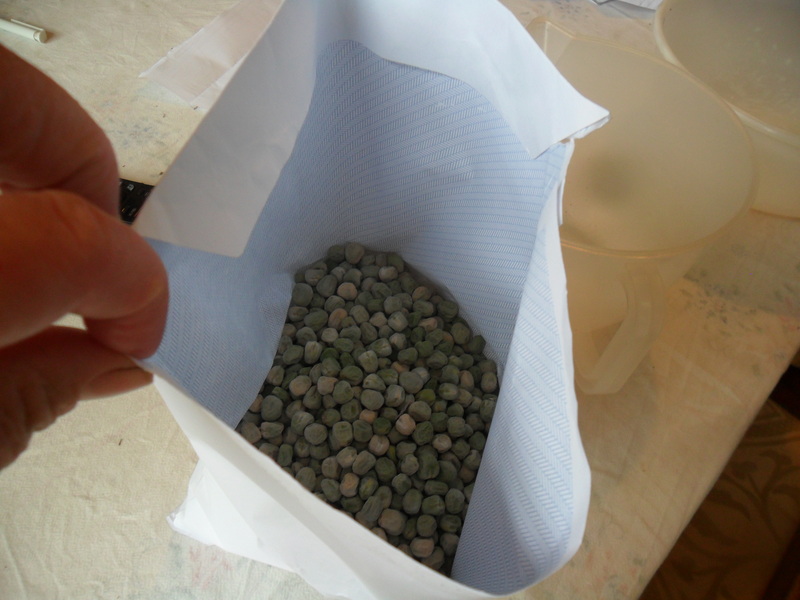 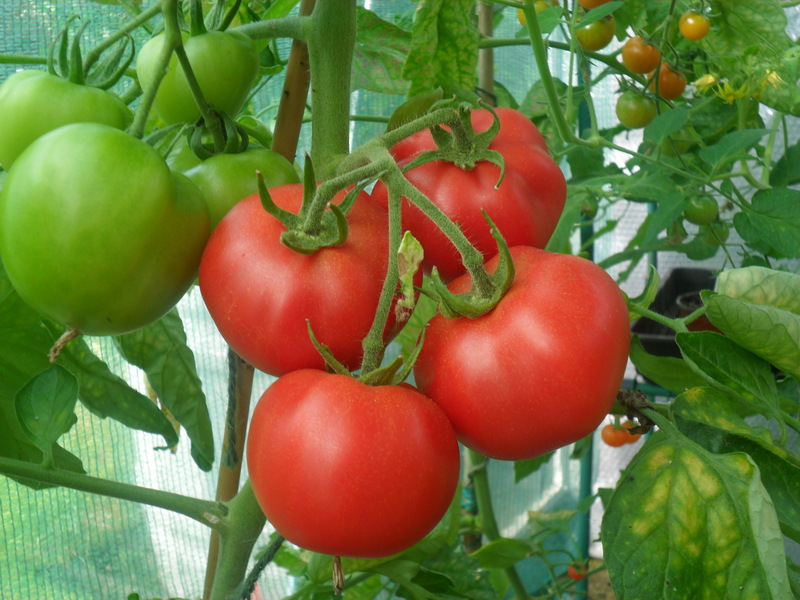 I had read different reports about them and came to the conclusion that they are a bit like ‘marmite’, you either love them or hate them….so I decided to grow them for myself. 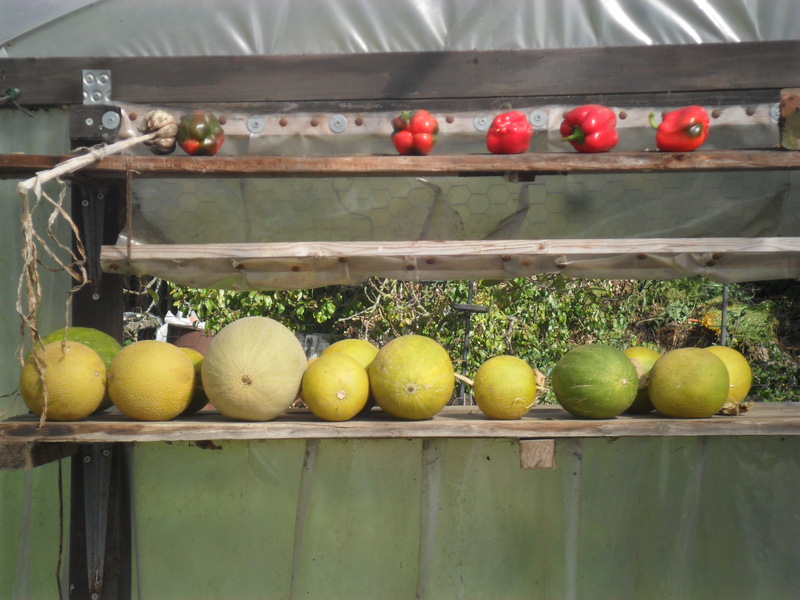 The fruits are grape sized and they are supposed to taste of cucumber with a hint of lime, but I am yet to taste one that actually had the hint of lime in it. 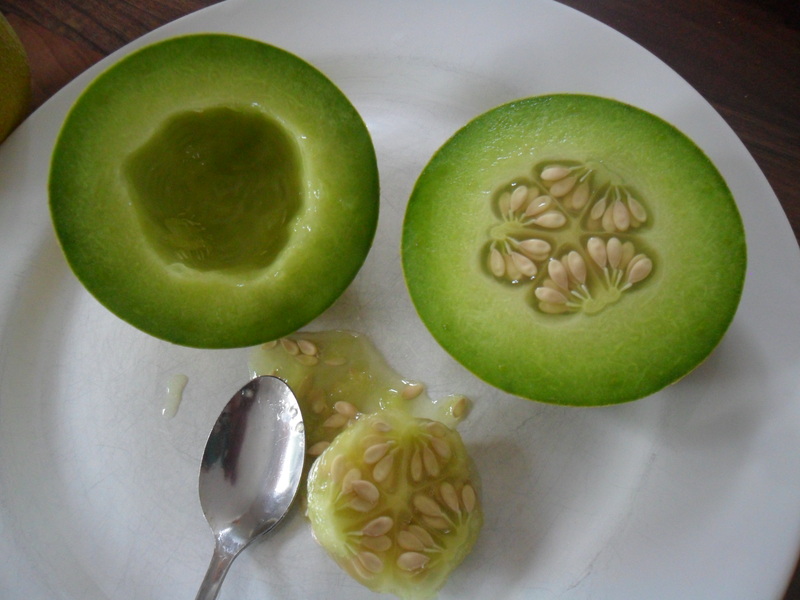 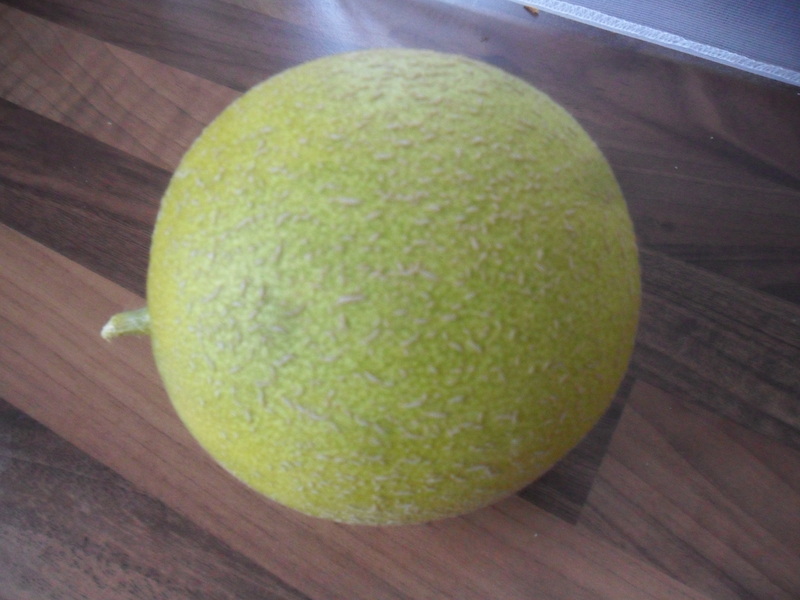 The cucamelon can be eaten whole or chopped up in salads. 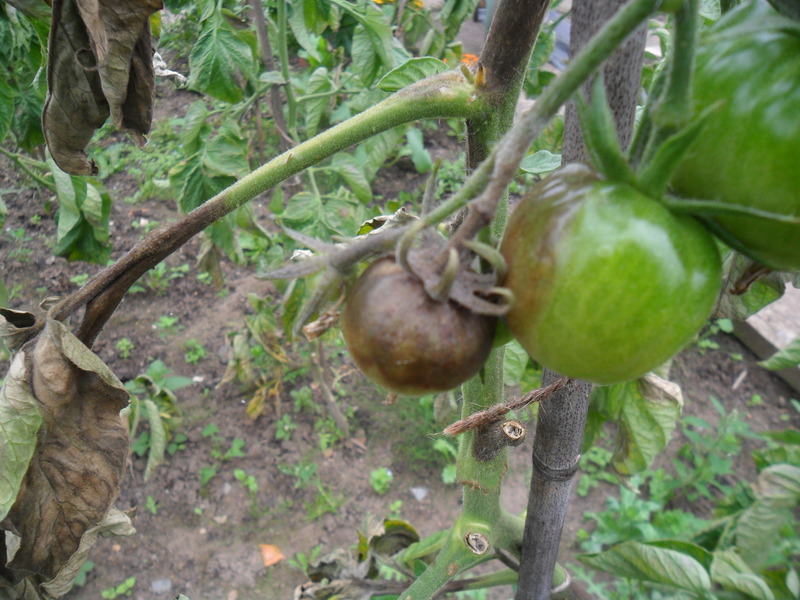 The skin has the texture of a sweet pepper, so it has a bite to it….inside it is like a mini cucumber. 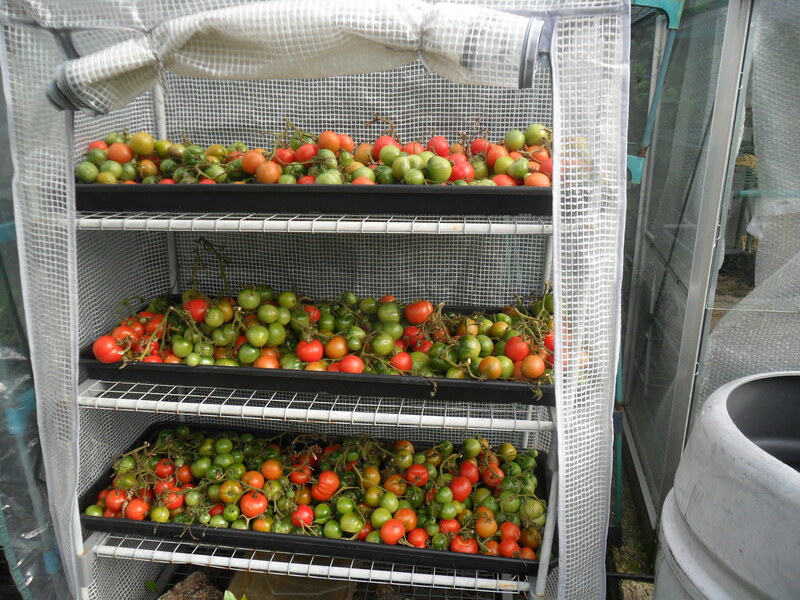 They were easy to grow in my polytunnel and after a slow start they started to take over, smothering my tomato plants that grew next to them, but I’ve got to say there were millions of fruits that just kept coming and coming and coming! 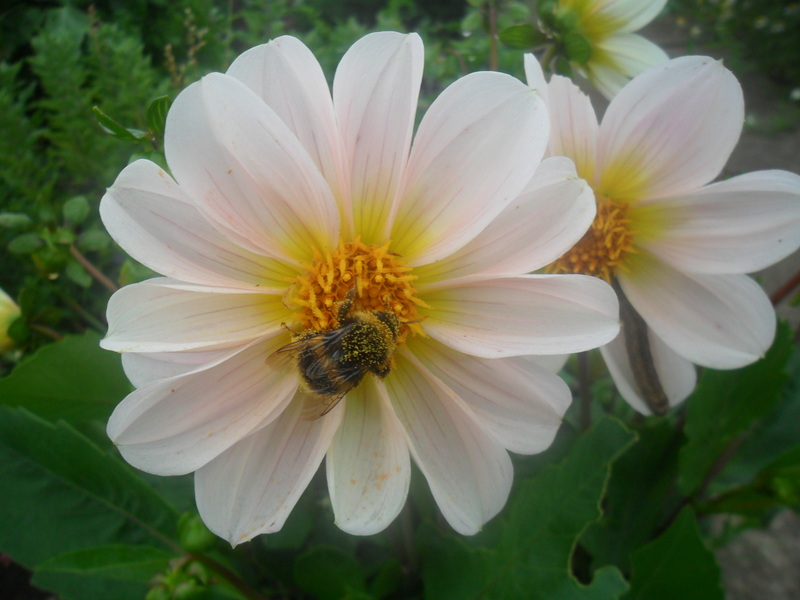 Unfortunately my family didn’t like them and after forcing them at anyone that came into our house, I found that not many other people liked them either. 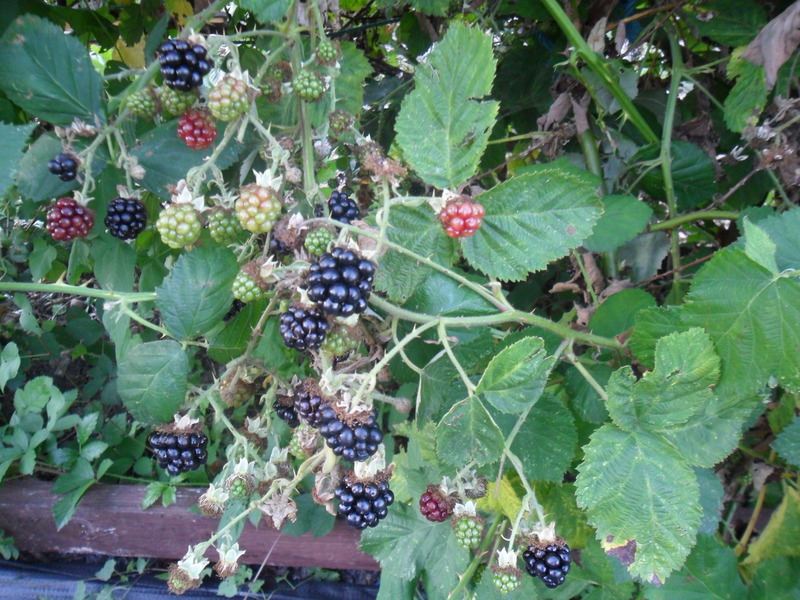 I didn’t think they were too bad, until I ate quite a few for tea one day and ended up with bad indigestion all night! 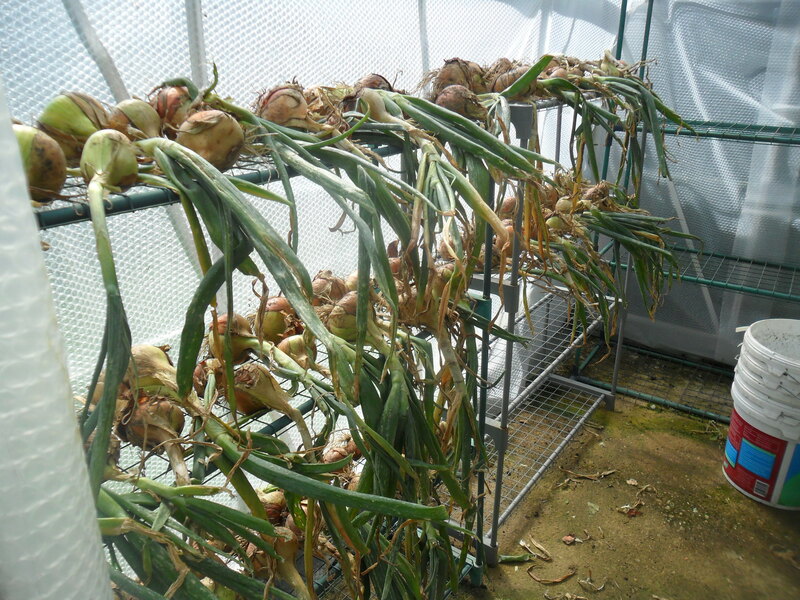 Needless to say, I won’t be growing these again….but we live and learn. 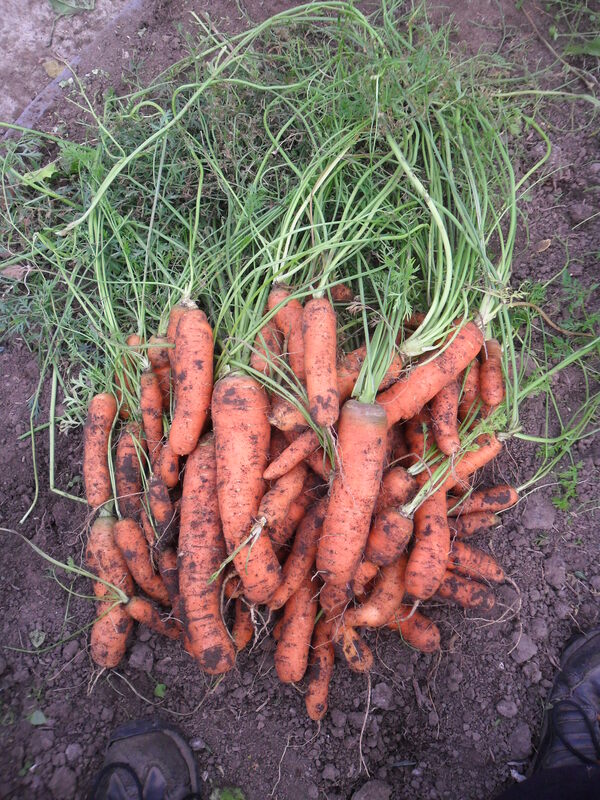 One surprise I did find in my polytunnel when I was clearing it, was some carrots that I had completely forgotten about…and they had grown really well. 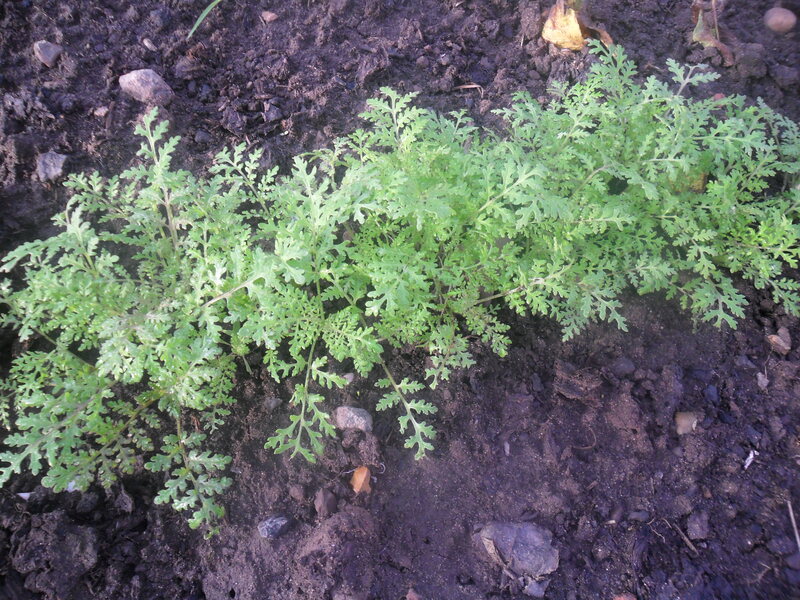 Carrots can be stored in compost at home until they are needed, but I know these carrots won’t last long in our house as everyone loves them. 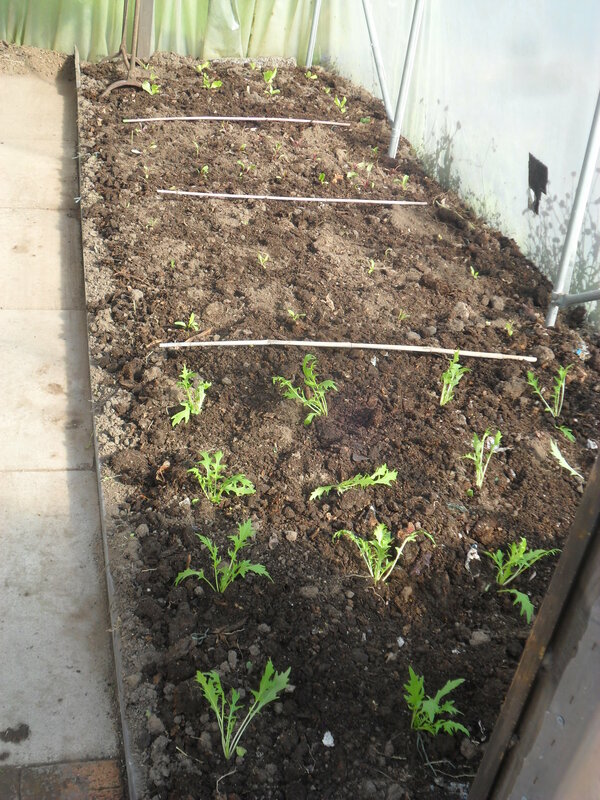 The winter salads that I chose to grow were mizuna, winter lettuce, corn salad, rocket and perpetual spinach. 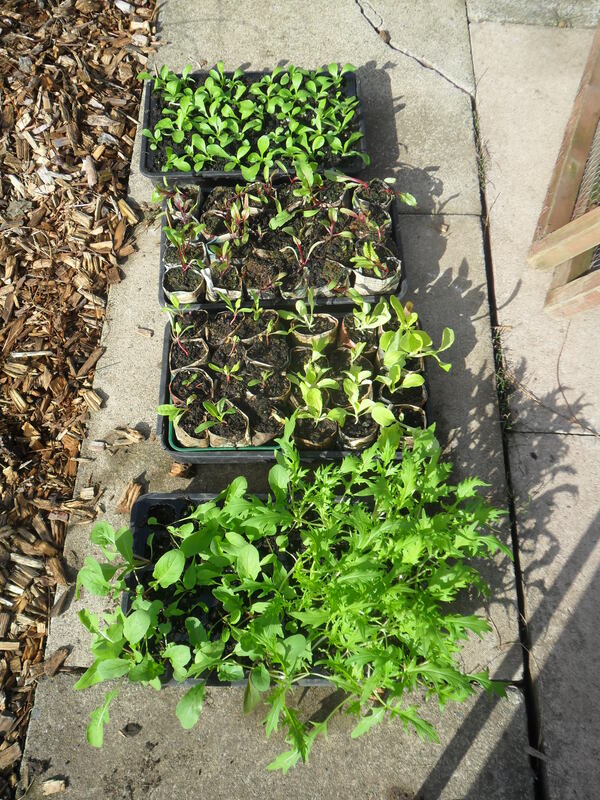 I also grew some beetroot as a trial, to see if I could use the small leaves over winter in salads (though I’m not expecting to grow a decent sized root). 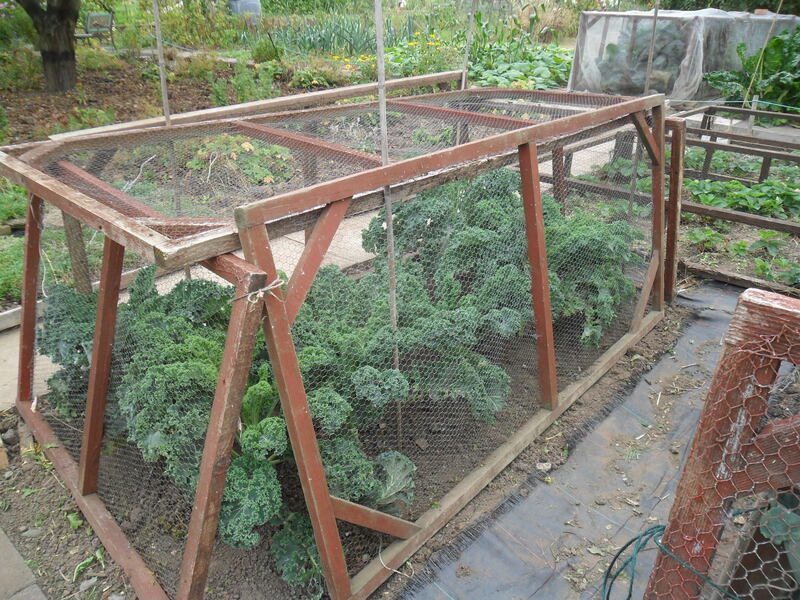 One of the things I have learnt from bitter experience, whether you grow plants in a cloche, a greenhouse or a polytunnel, you need to provide ventilation during the autumn or winter months. 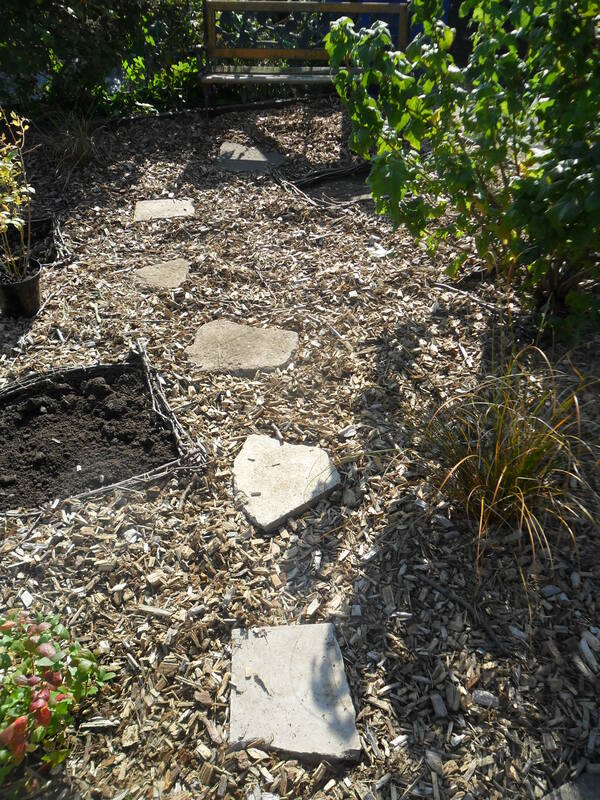 If you don’t then the humid conditions will be a breeding ground for grey mould, which will smother and kill your plants. 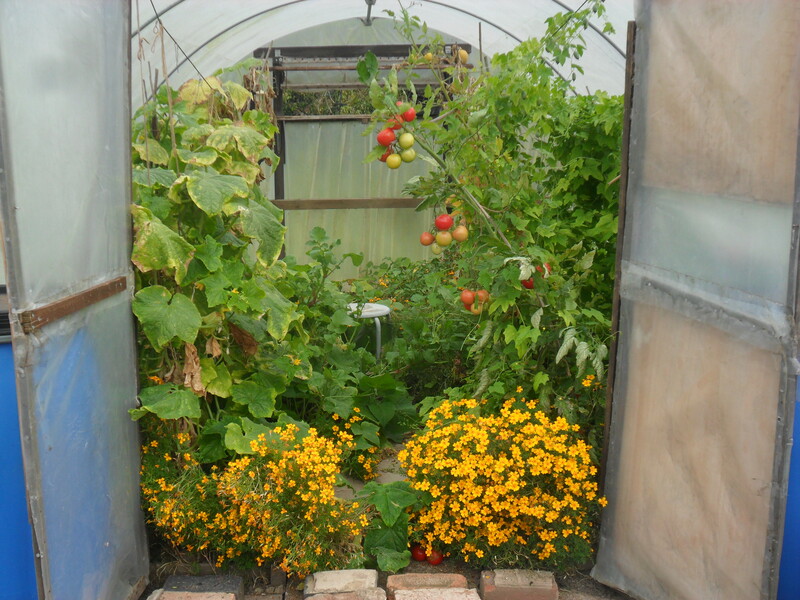 So on fine days I open the doors on my polytunnel throughout the winter months. 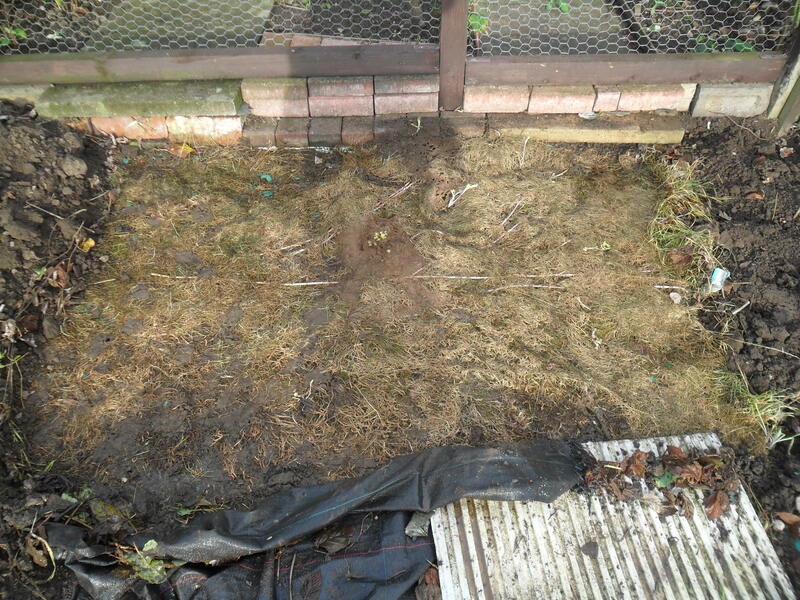 “Grey mould is caused by a fungus called ‘Botrytis cinerea’ which can infect plants at any time of the year. 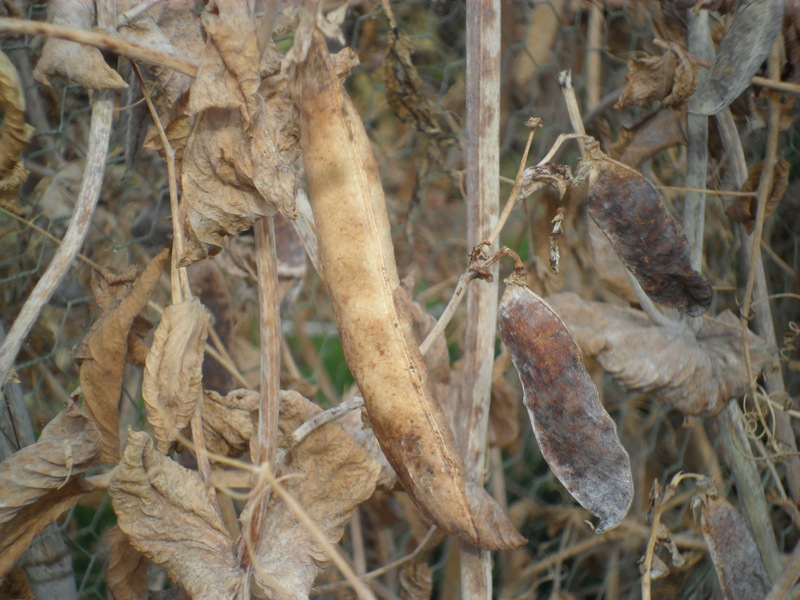 It can enter a plant through a wound or infect a weak plant under stress. 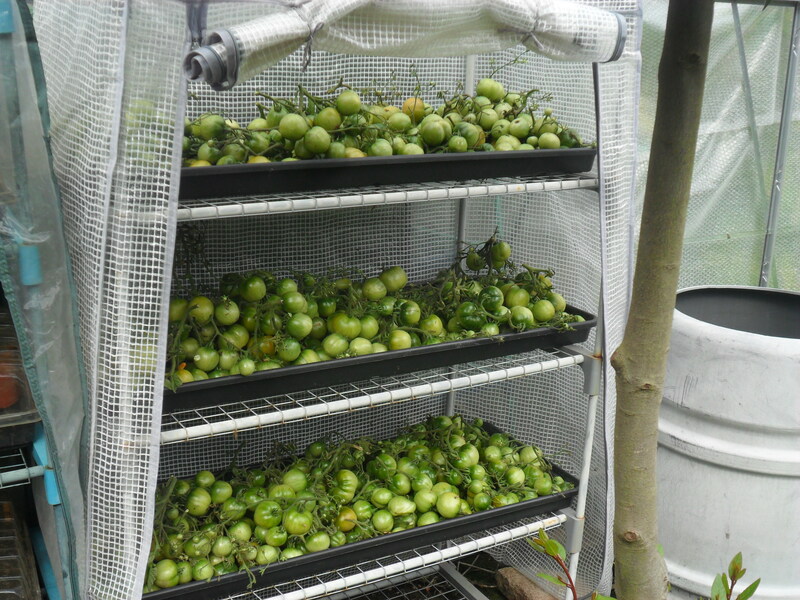 It will also infect healthy plants in humid conditions”. 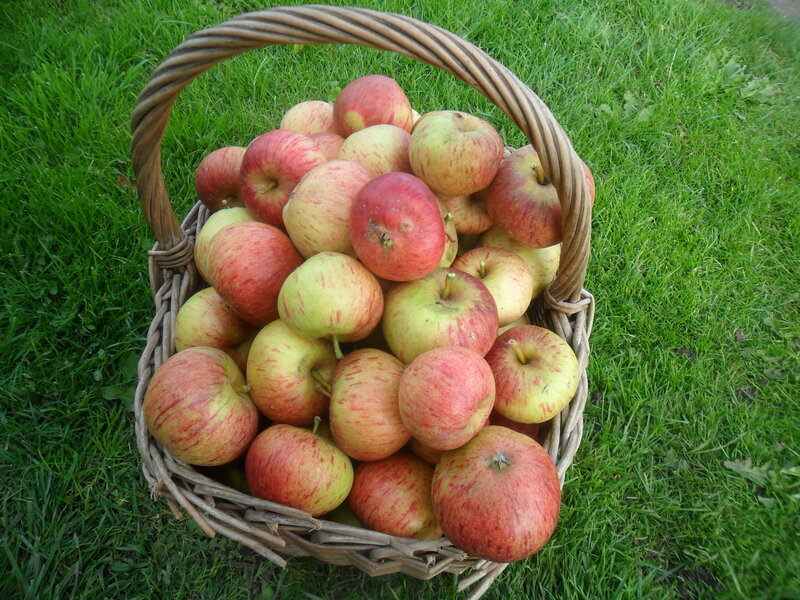 …and I only have a few left to use now, which again shows me that Autumn is here and the wonderful harvest of summer is nearly behind us. 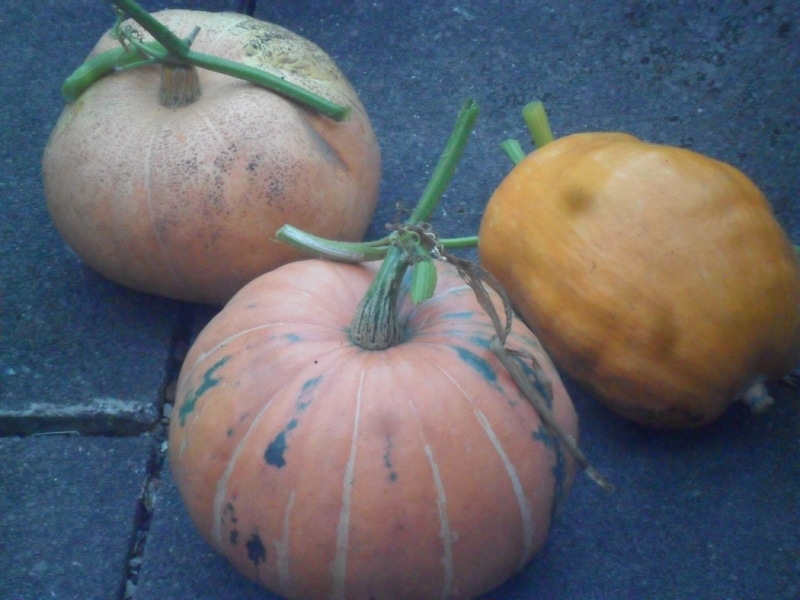 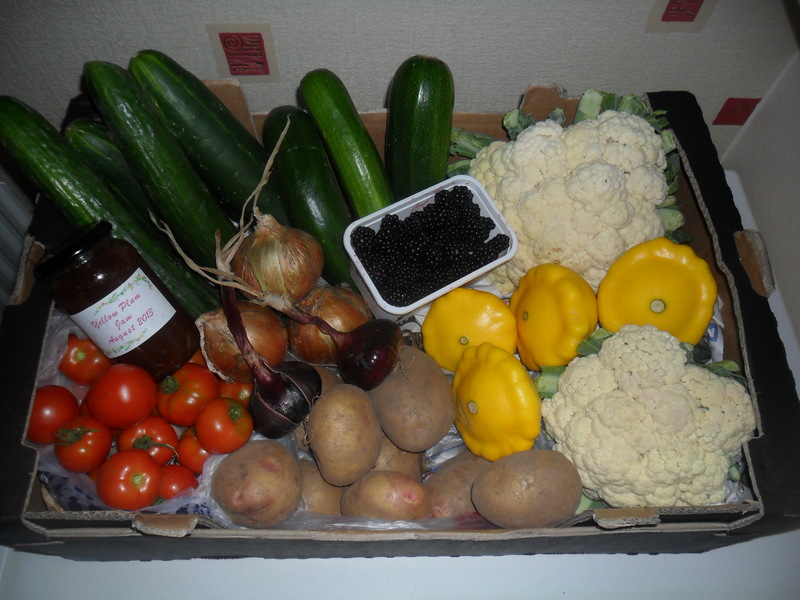 Now it’s the time that the Autumn harvest of pumpkins, butternut squashes, apples etc. 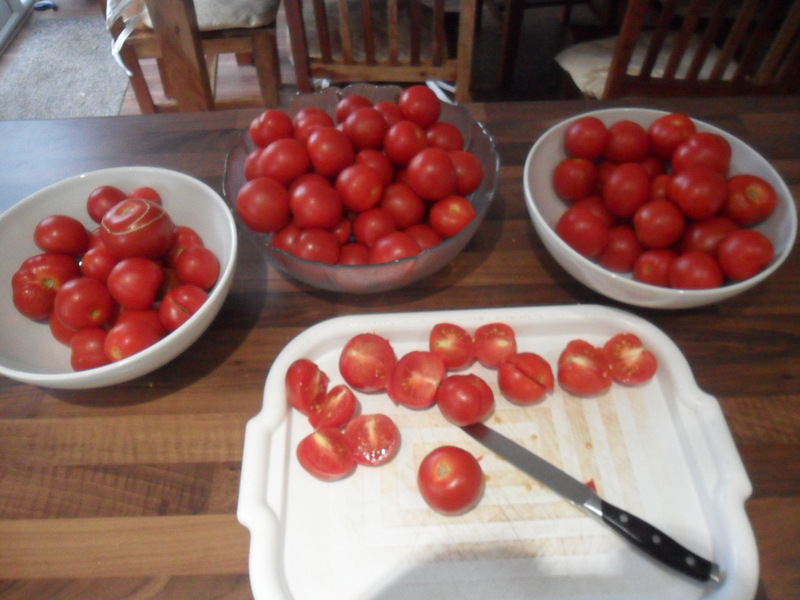 begins. 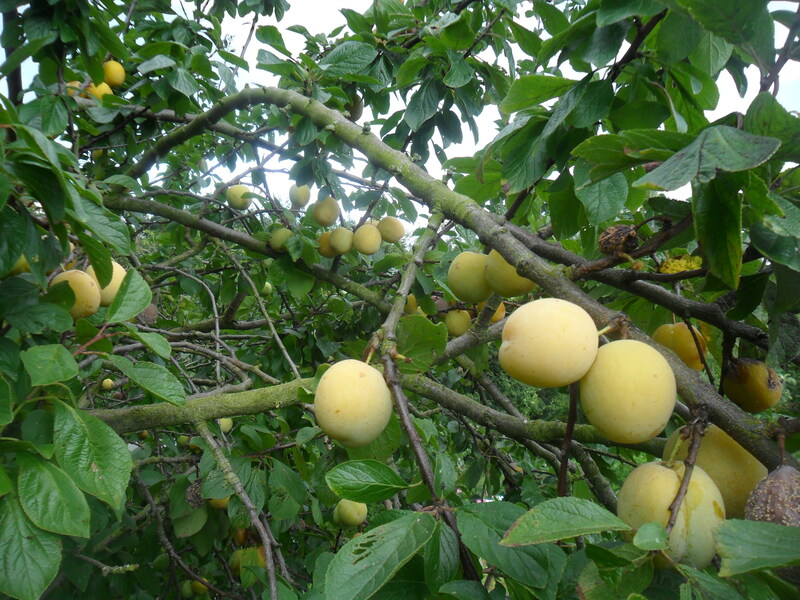 The nights start to draw in and the leaves on the trees begin to fall. 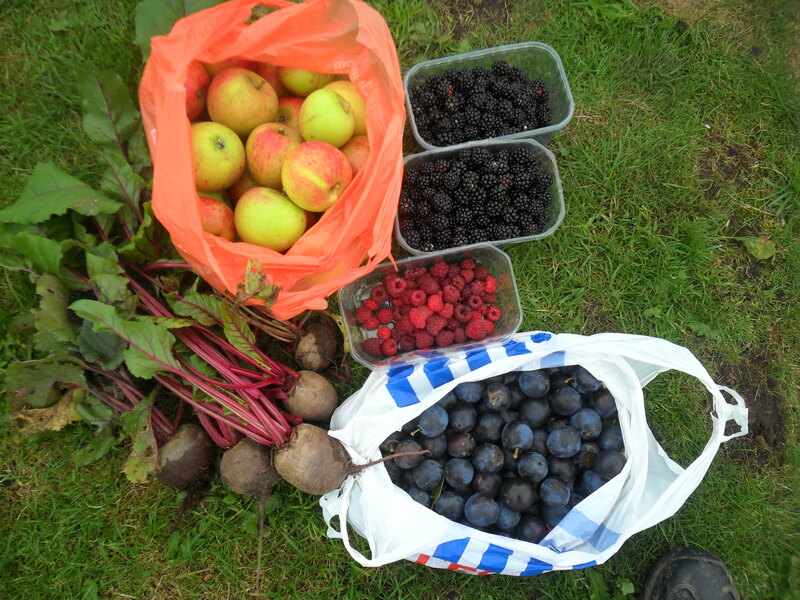 This is my favourite time of year when I start to reflect on my gardening year and work out what crops have been a success and which haven’t. 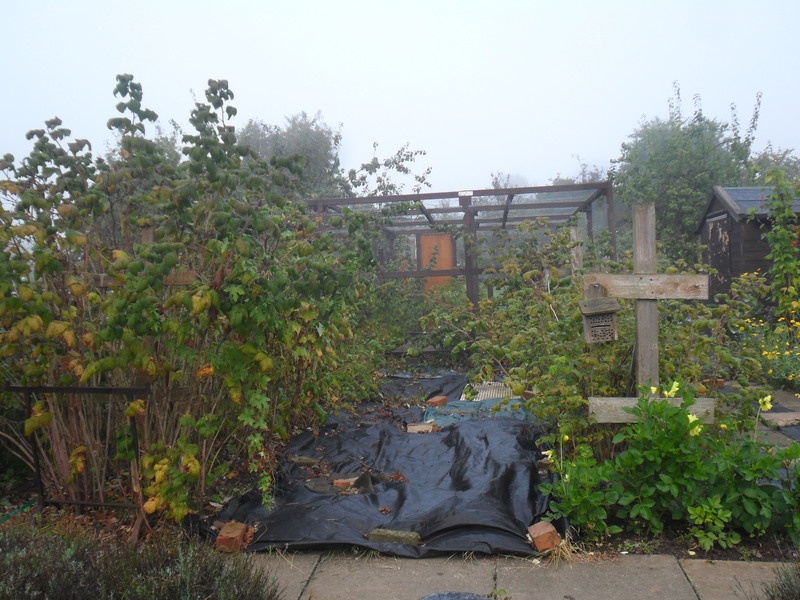 It’s the time of the year when things start to slow down slightly at the allotment, giving me time to breathe and admier the late summer flowers on my plot. 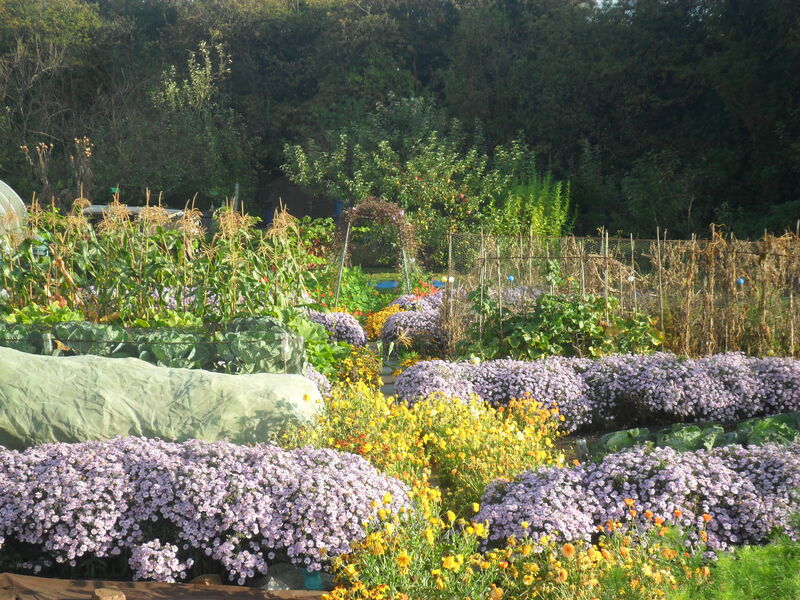 When I work my plot on a crisp Autumn morning it makes me feel glad to be alive. 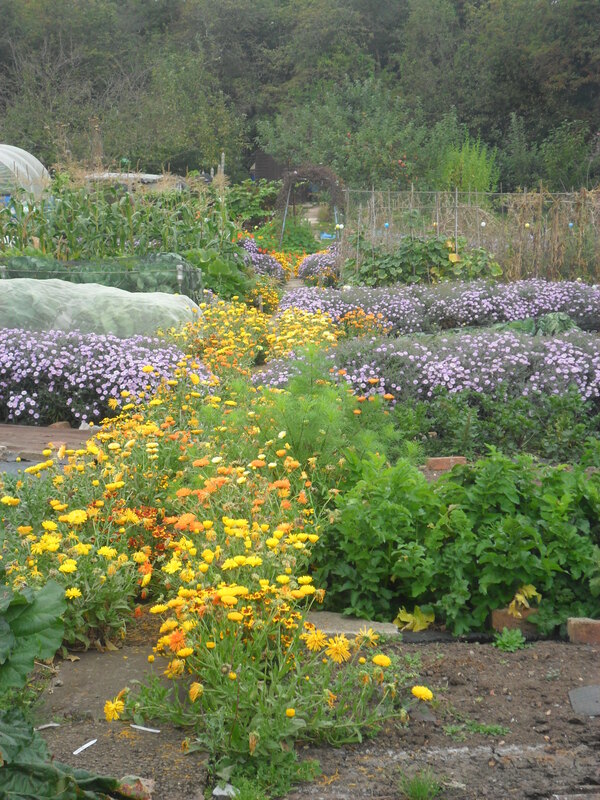 This week at my allotment my Michaelmas daisys have begun to flower and they look beautiful, standing next to the yellow and orange marigolds and calendulas. 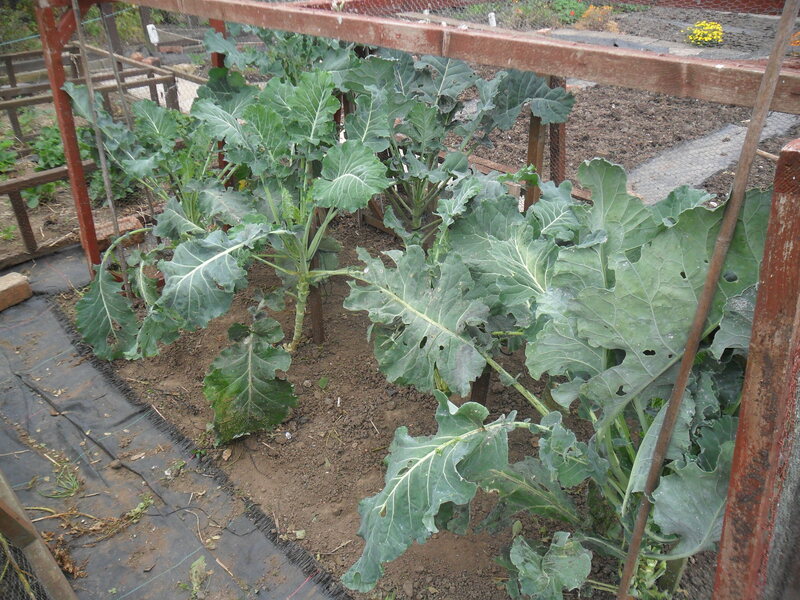 I removed the netting from my brassicas and gave them a good weed and removed any yellowing leaves. 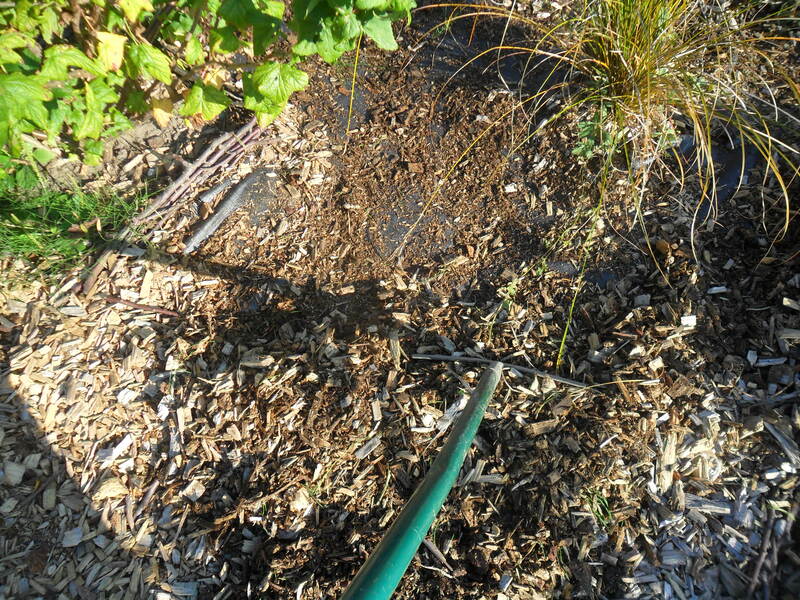 By removing any dead foliage, it helps to stop any pests from hiding underneath them. 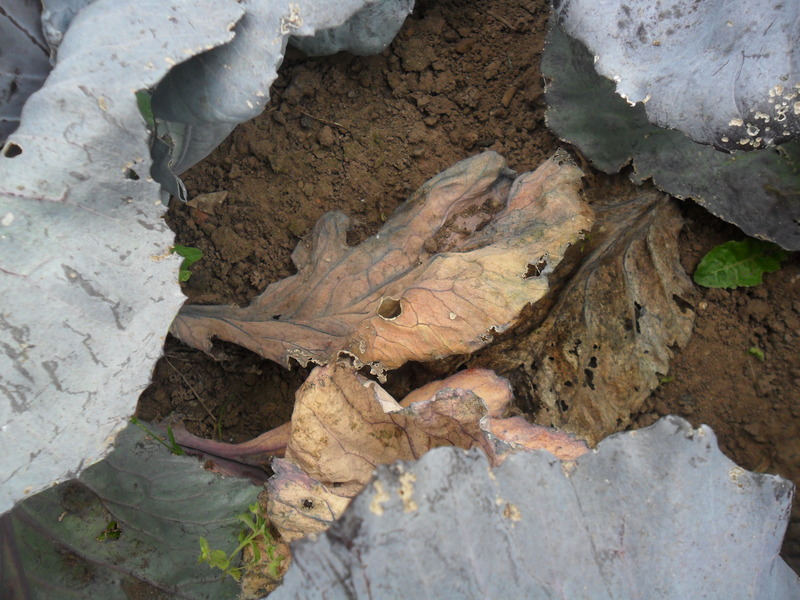 ‘Sooty mould’ is a black or dark brown powdery fungus that covers the leaf and it actually looks a bit like soot. 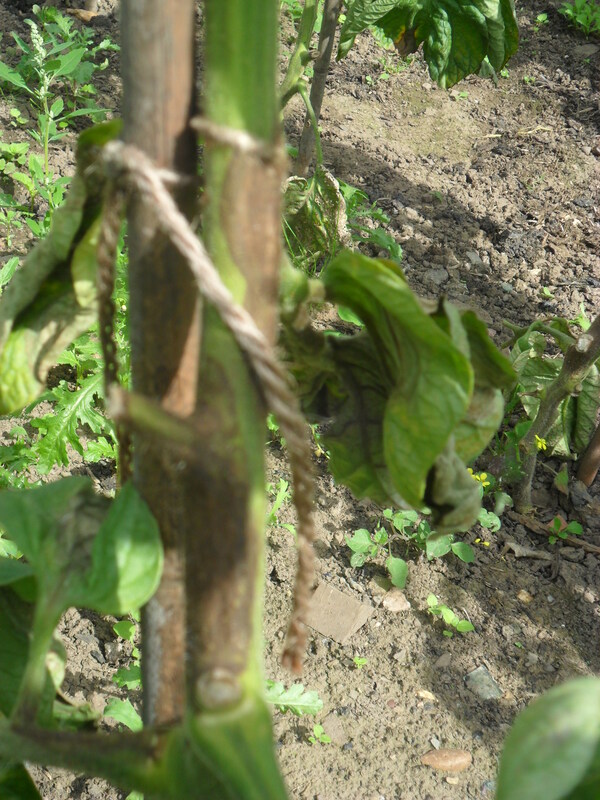 In severe cases it stops the plant from photosynthesising and severely weakens it or even kills the plant. 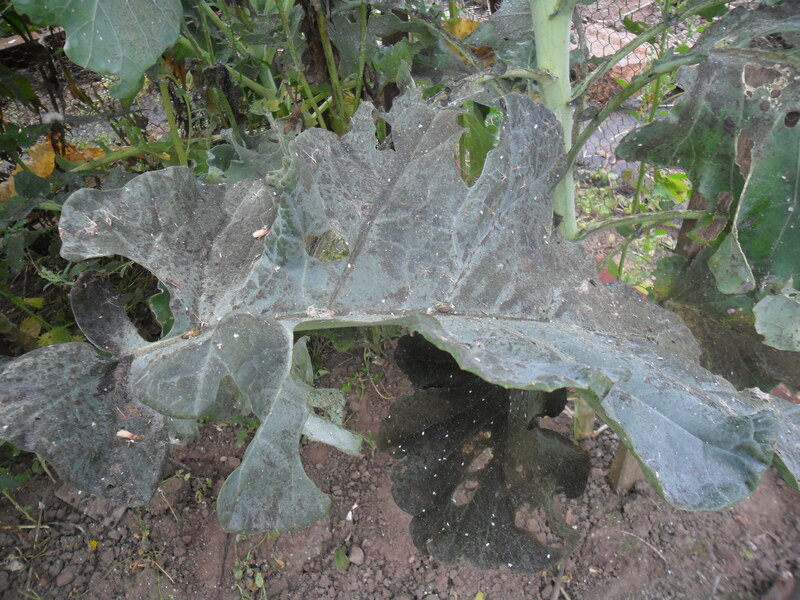 ‘Sooty mould’ is a fungal disease caused by sap sooting insects such as aphids, scale insects, mealy bugs etc, or in my case it is whitefly. 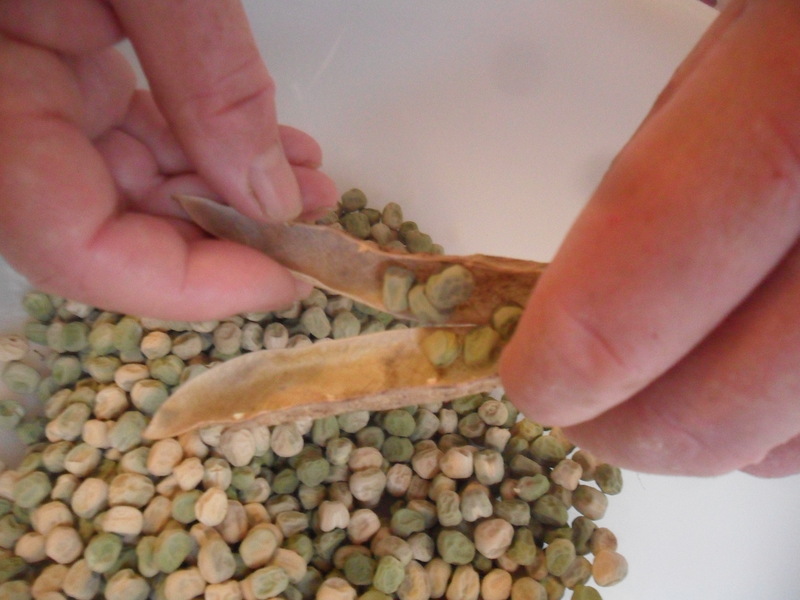 I removed the two infected leaves on my plant and I will continue to monitor the situation. 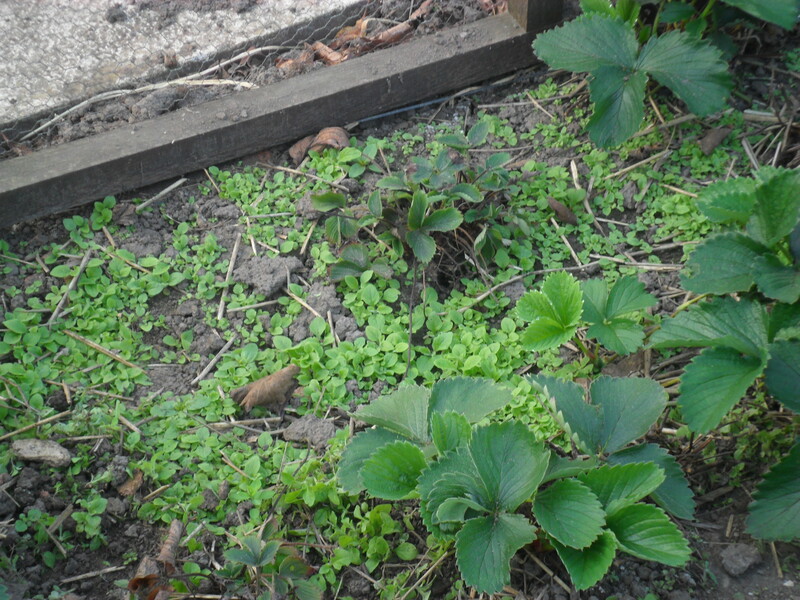 If it gets too bad I will use a ‘soft soap’ spray, but for the mean time I will do nothing as it isn’t affecting my plant too badly and in the past I have still had good crops from plants covered in white fly. 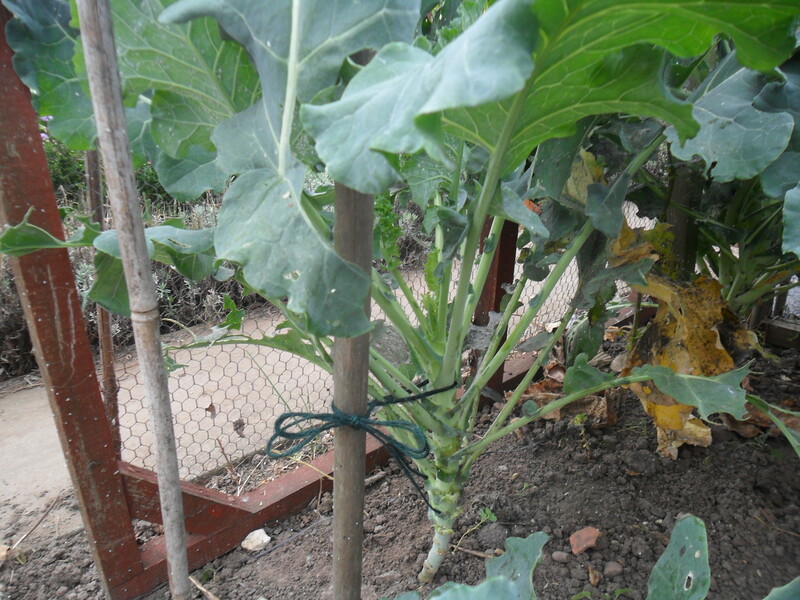 One other thing I did whilst removing the yellowing leaves on my brocolli, was to tie each plant to a support. 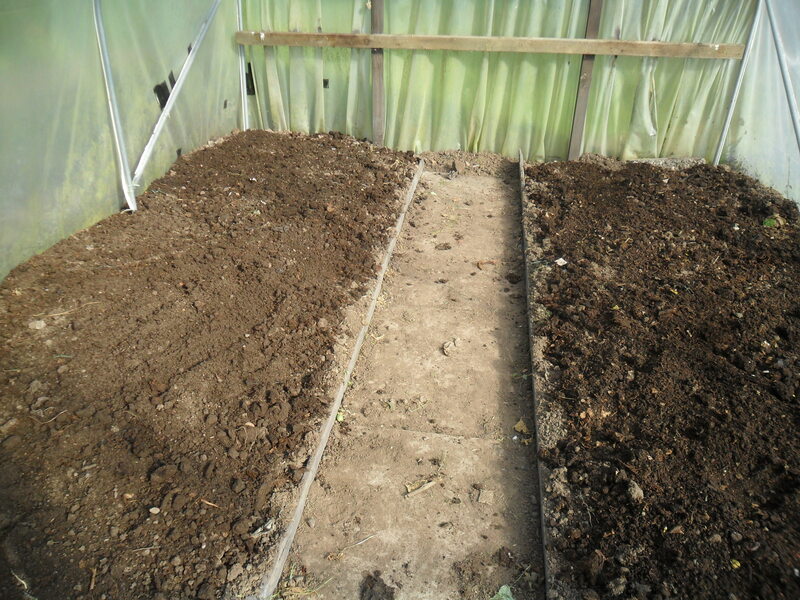 I place a support into the ground next to my brocolli and brussels when I first transplant them earlier in the year. 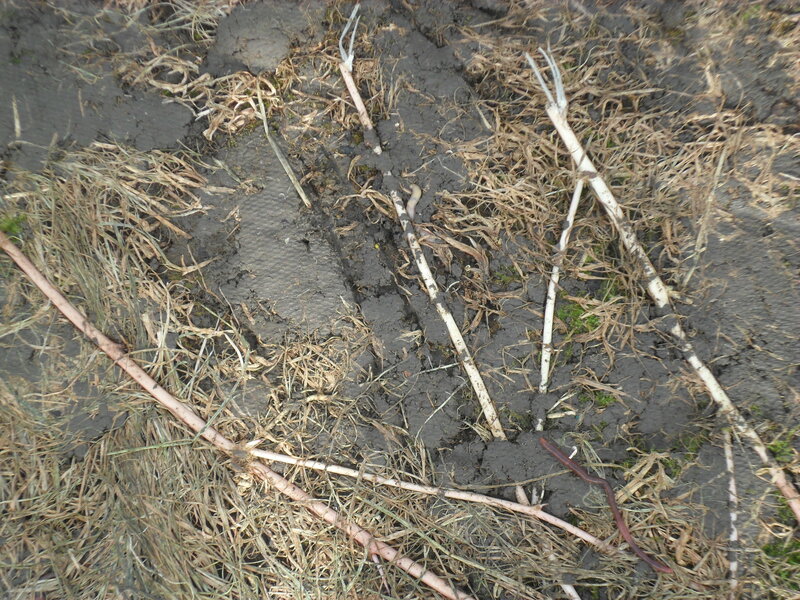 This way, I don’t damage the larger roots when the plants are bigger. 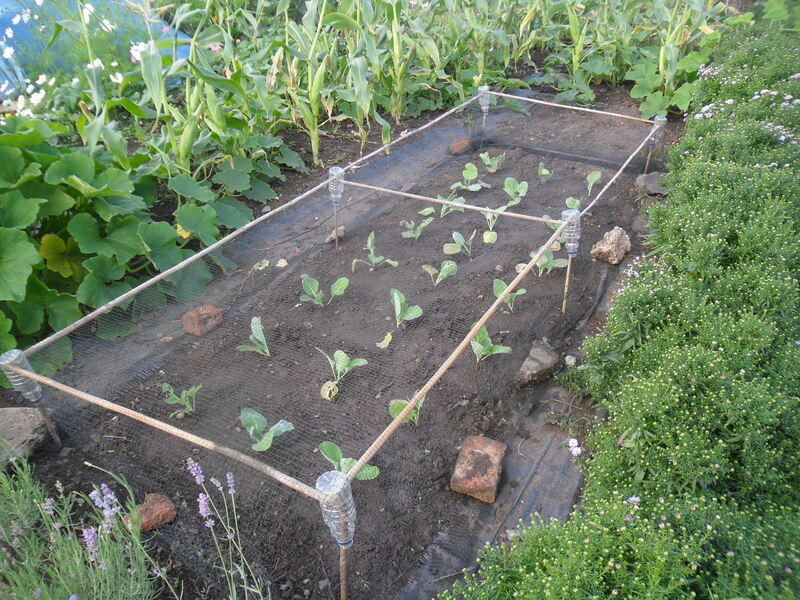 Tying the plants to the supports will help avoid the plants rocking when strong winds blow them about. 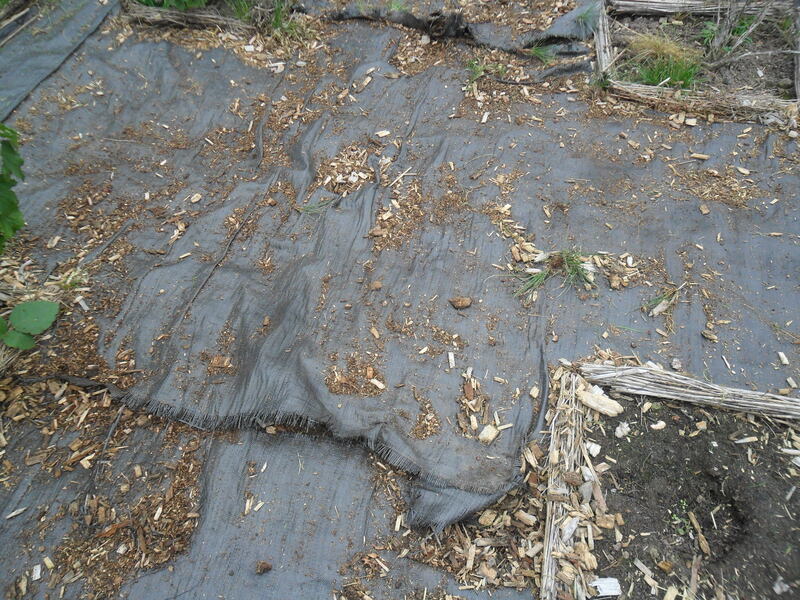 The movement is sometimes called ‘wind rock’ and it can break some of the tiny root hairs that are responsible for taking in the nutrients from the soil. 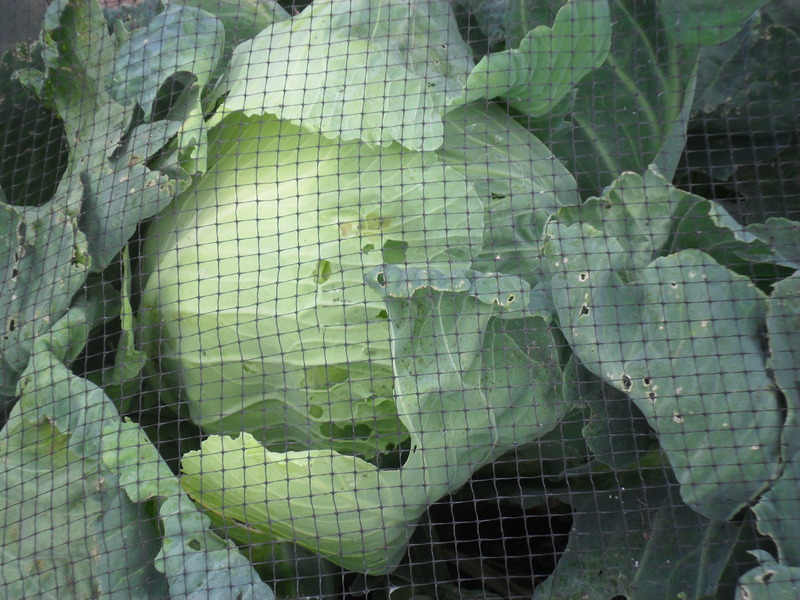 This can cause the plants to weaken and brussel sprouts to ‘blow’. 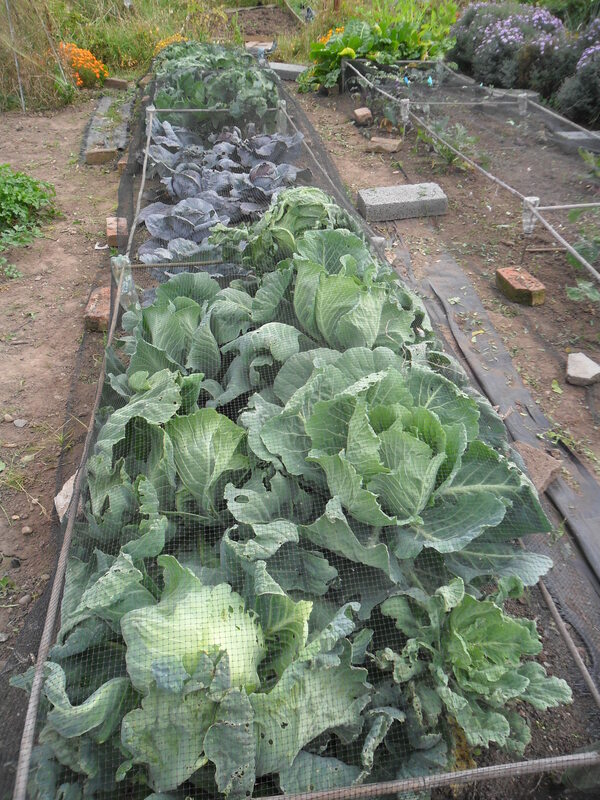 I noticed this week that some of my cabbages are finally ready to eat. 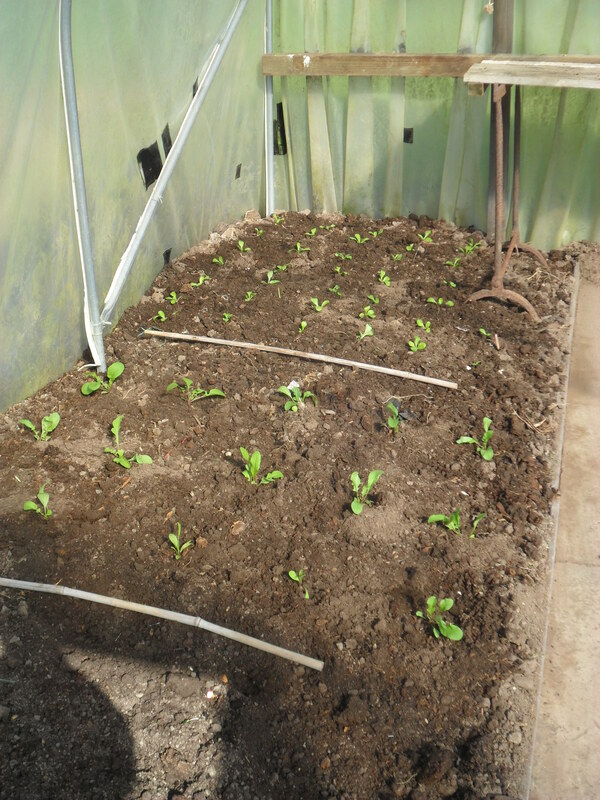 Unfortunately these cabbages took a battering from ‘flea beatle’ when they were originally transplanted back in early summer. 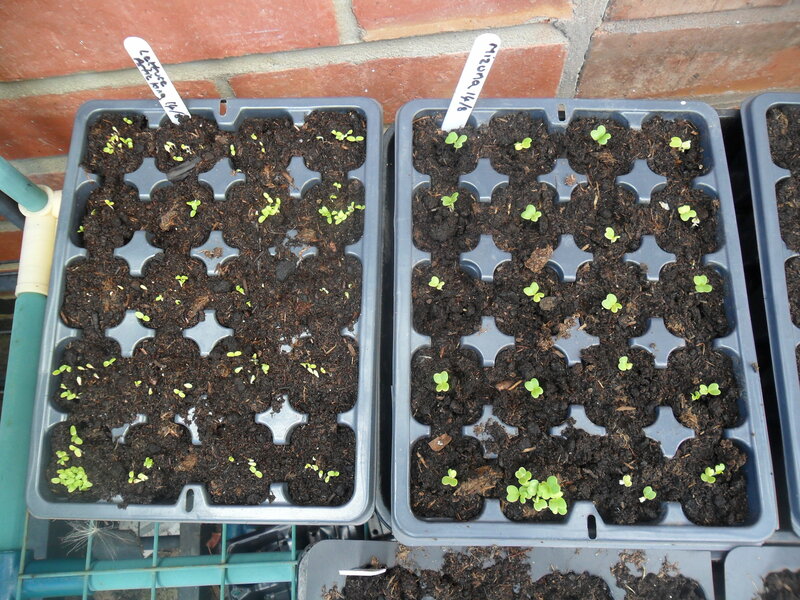 This week I have also transplanted my Spring cabbage. 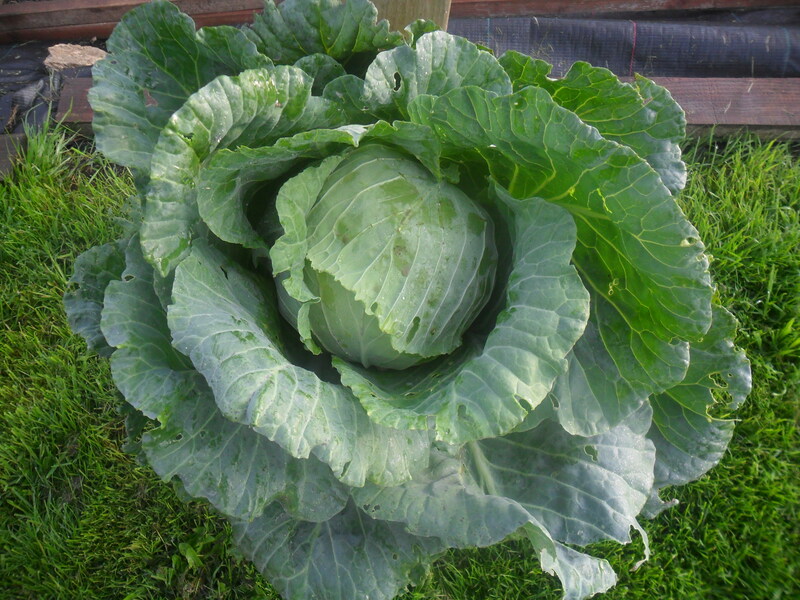 I didn’t grow my own Spring cabbage this year, so I bought the plants from a local nursery. 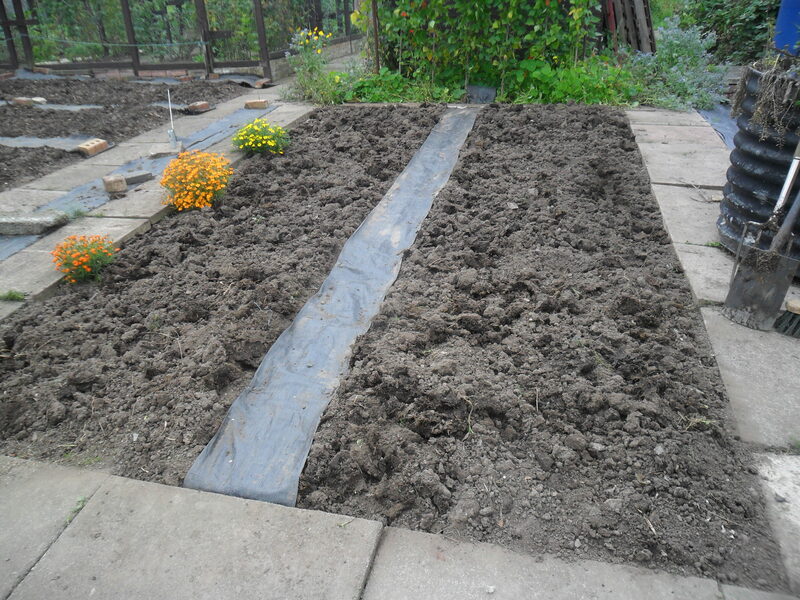 I raked in some Blood, fish and bone and then transplanted the plants and gave each one a homemade ‘cabbage collar’ to stop the cabbage root fly form laying it’s eggs at the base of my plants. 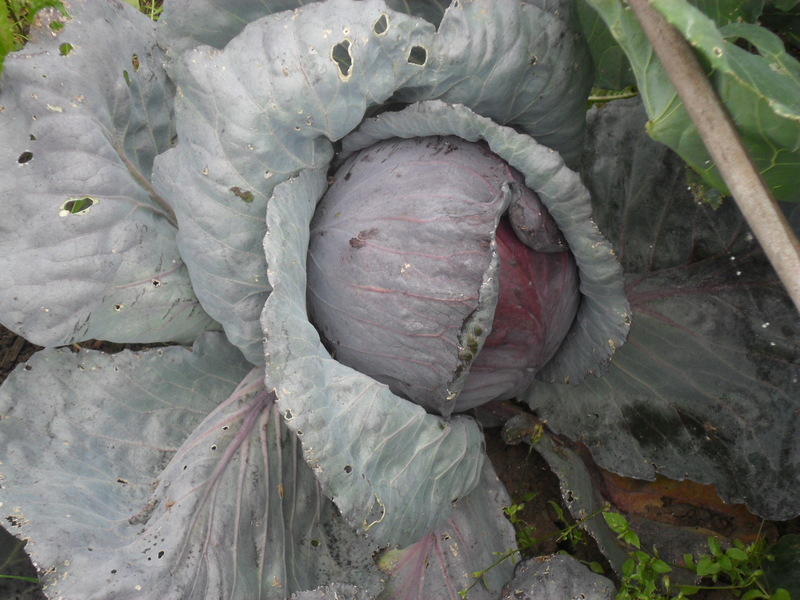 Cabbage collars cost between £3 or £4 to buy a pack of 30. 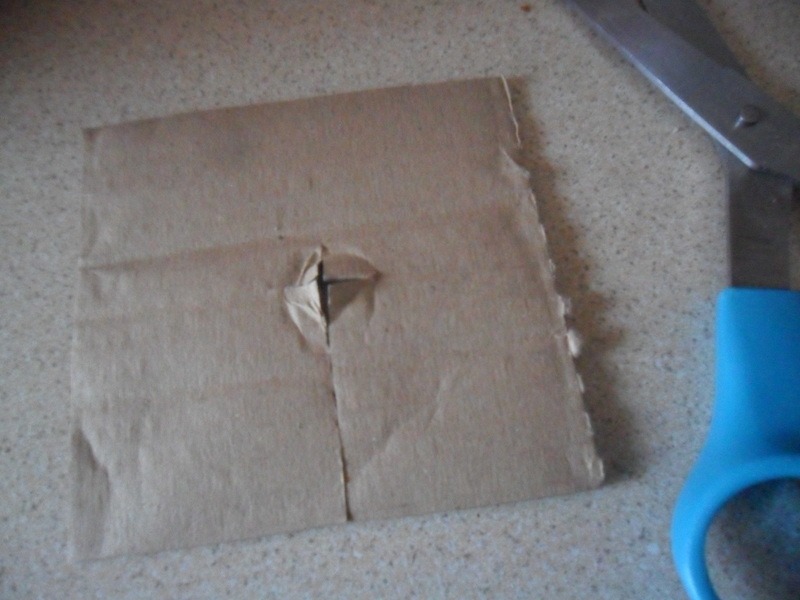 To save money I make my own by cutting out a square of thick cardboard and then cutting a cross in the middle where the stem will go. 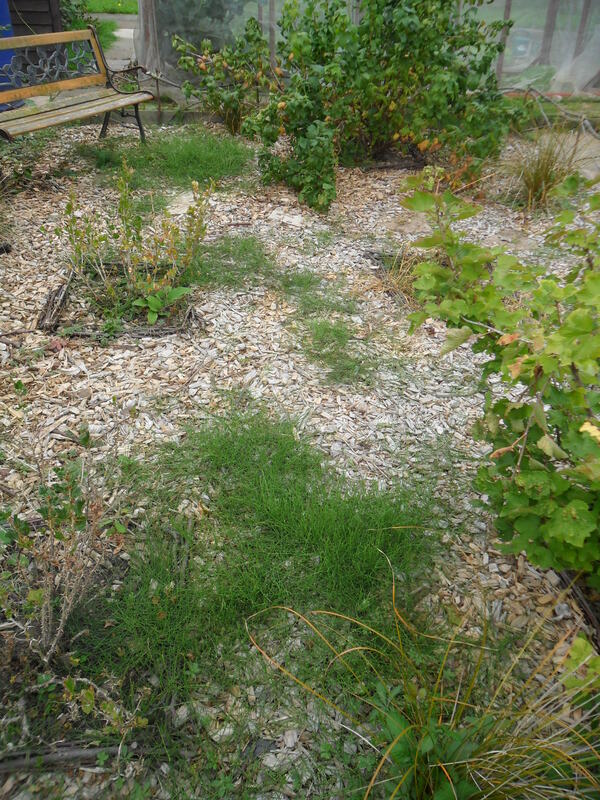 As the stem grows it can expand because of the cross in the middle. 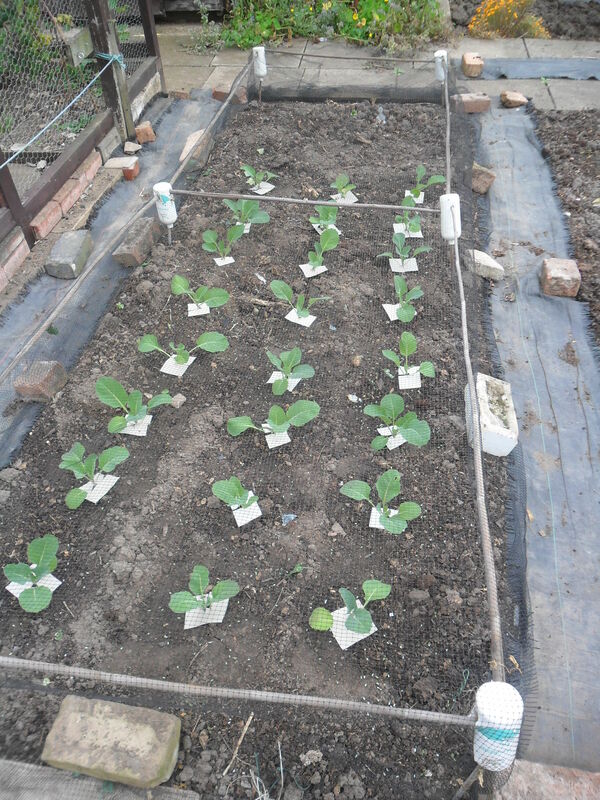 I place each collar around the stem and it will stop the cabbage root fly from laying it’s eggs and eventually it will just decompose into the soil. 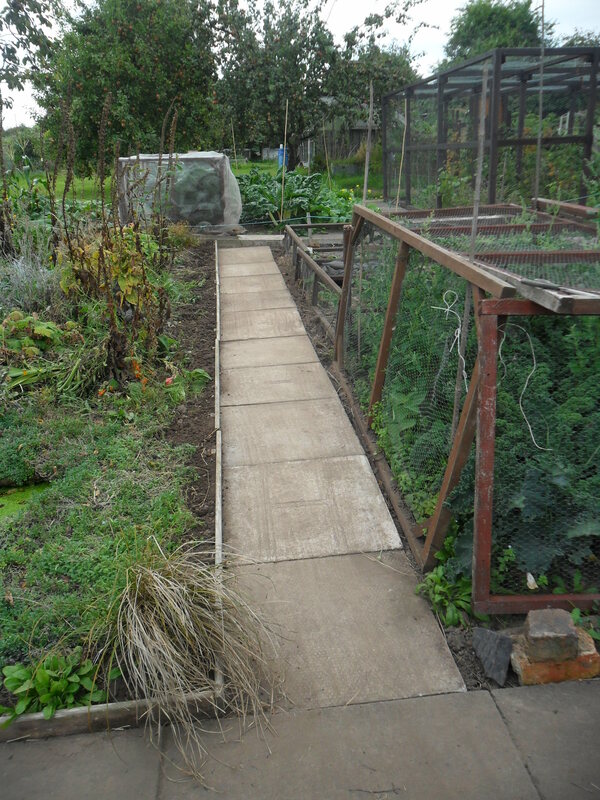 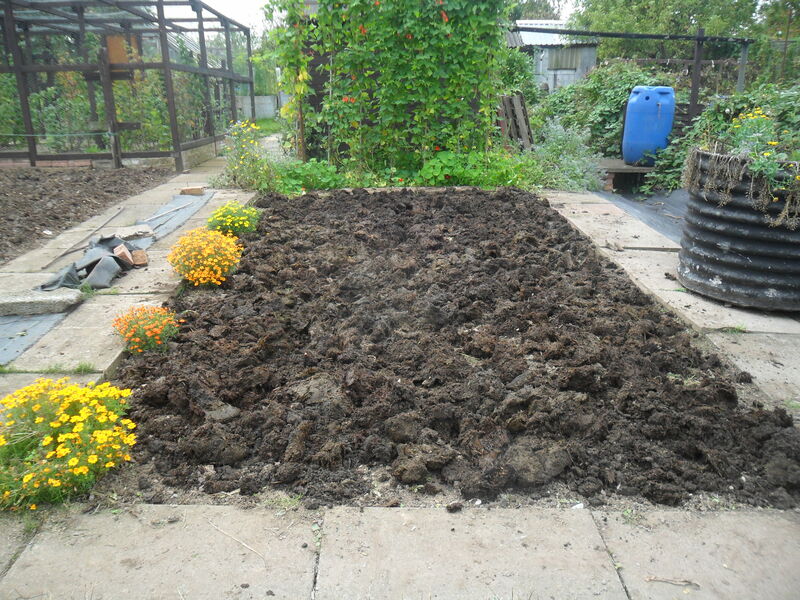 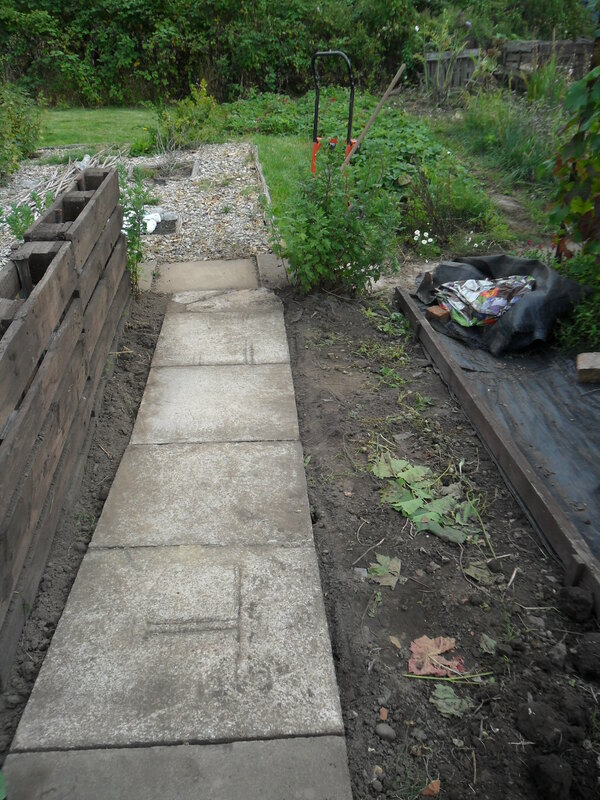 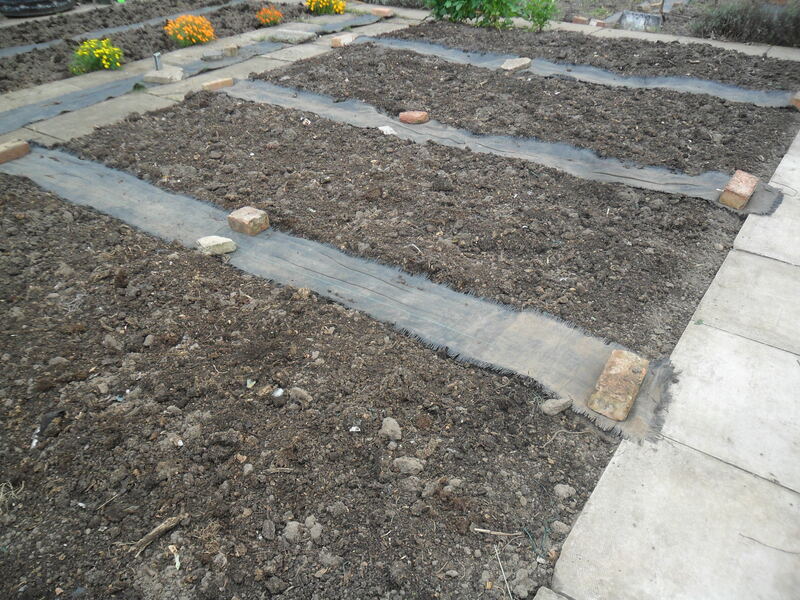 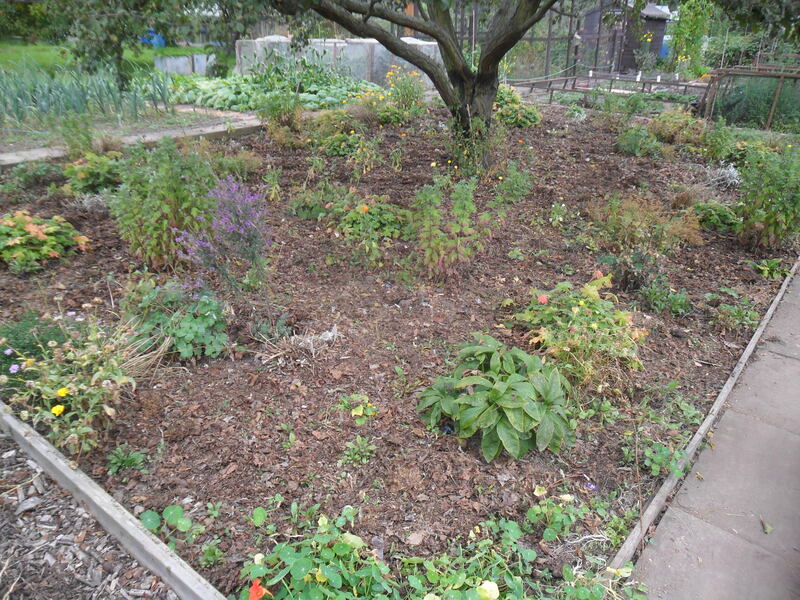 This week at my allotment I decided to move one or two large slabs and unfortunately I tripped over backwards and ended up with the slab in the photo below, on top of me! 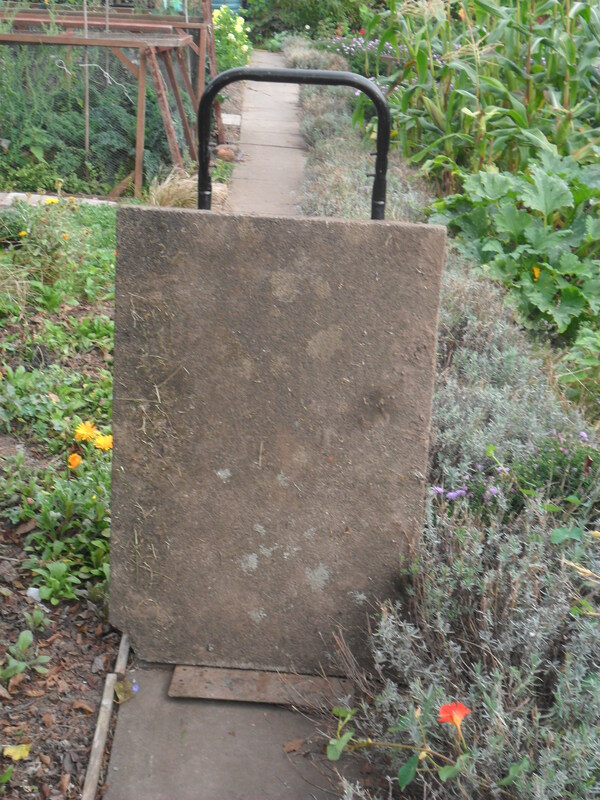 Luckily the sack barrow took the weight of the slab, but I must have looked like one of those cartoon characters with just my arms and legs hanging out from the sides of the slab!…I must have looked funny. 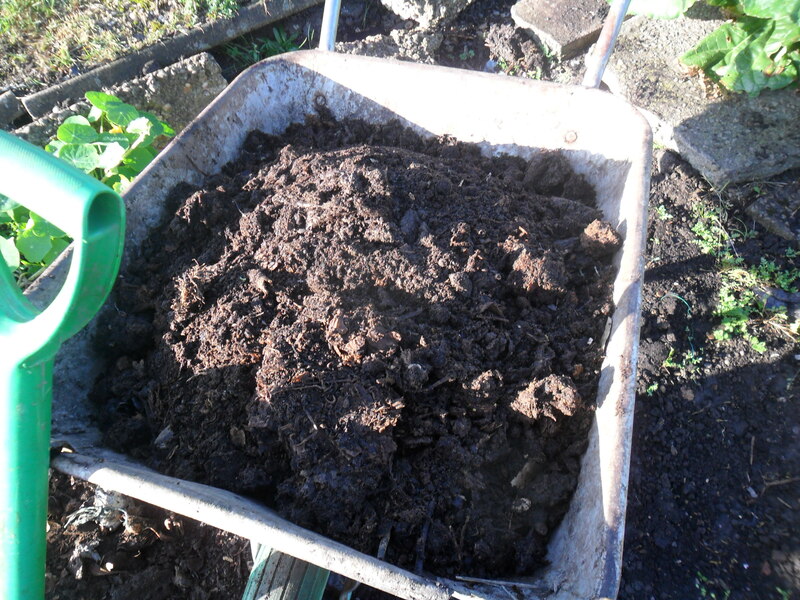 There was no harm done though and I just ended up with a bruise on my leg and a ‘bottom’ that hurt the next day! 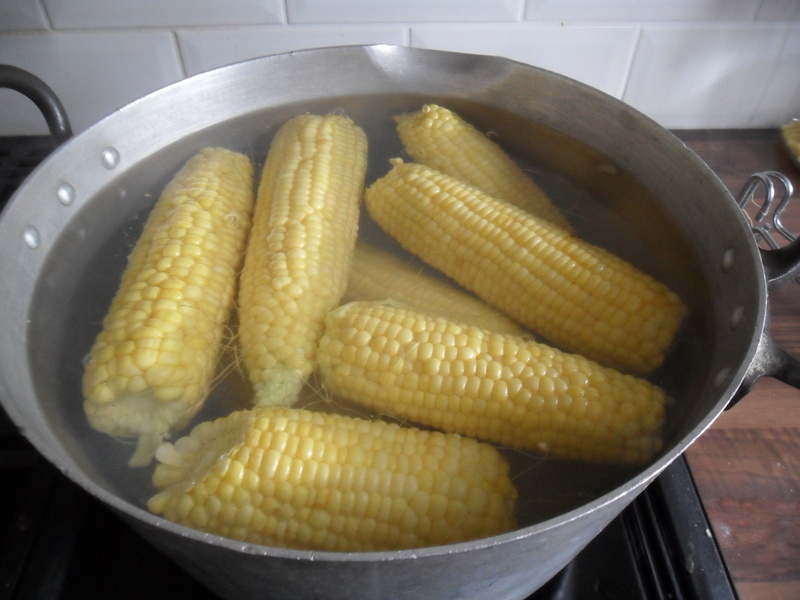 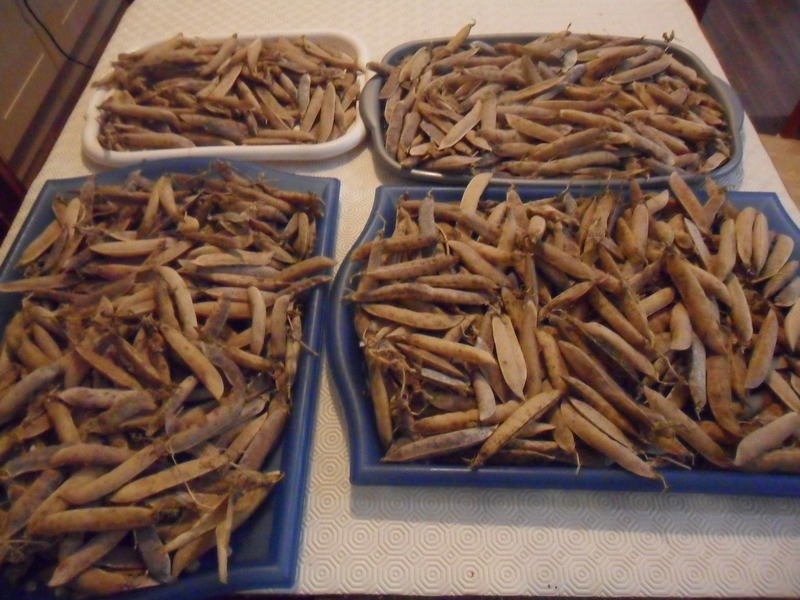 Finally, at home this week I have been blanching and freezing my sweetcorn. 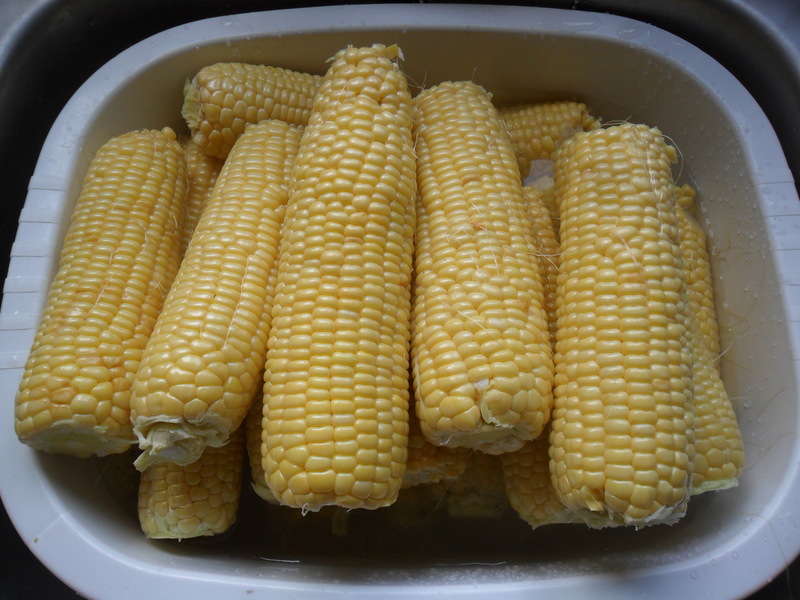 I have had a really good crop of sweetcorn this year, probably due to the warm summer. 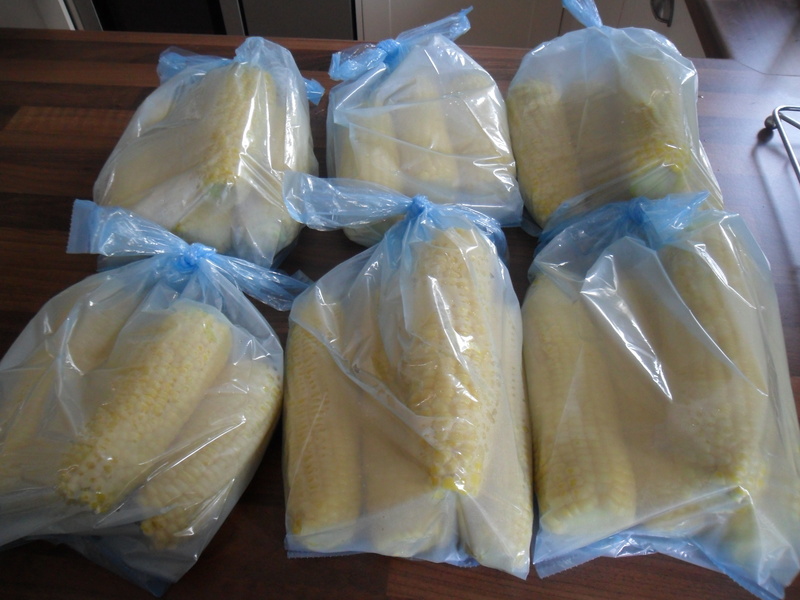 I washed the sweetcorn and then blanched them for five minures before bagging them up in family sized portions and freezing. 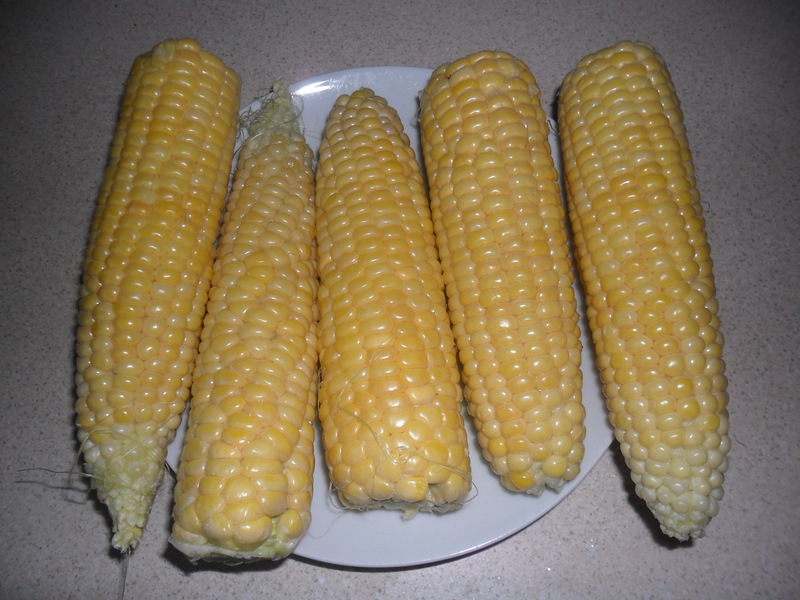 It’s lovely having sweetcorn in the depths of winter as it always reminds of summer. 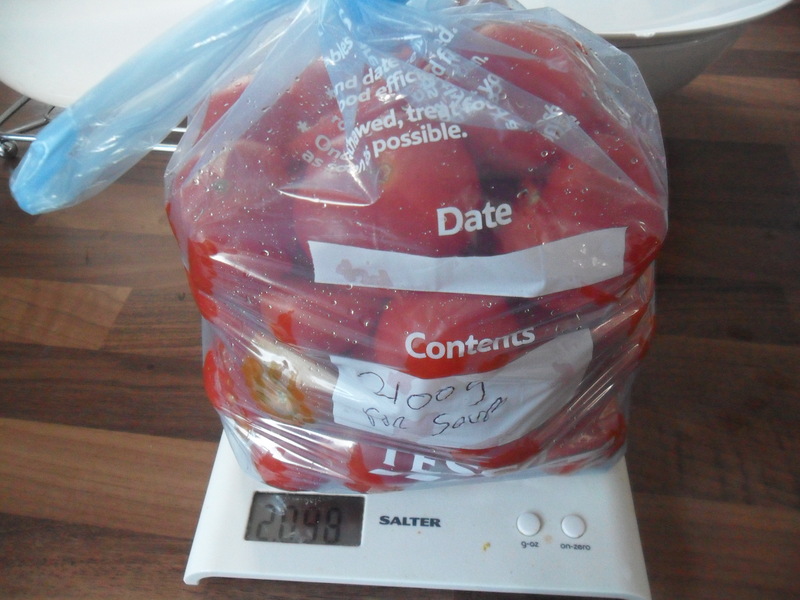 I also weighed and bagged up some of the tomatoes that are ripening outside at home. 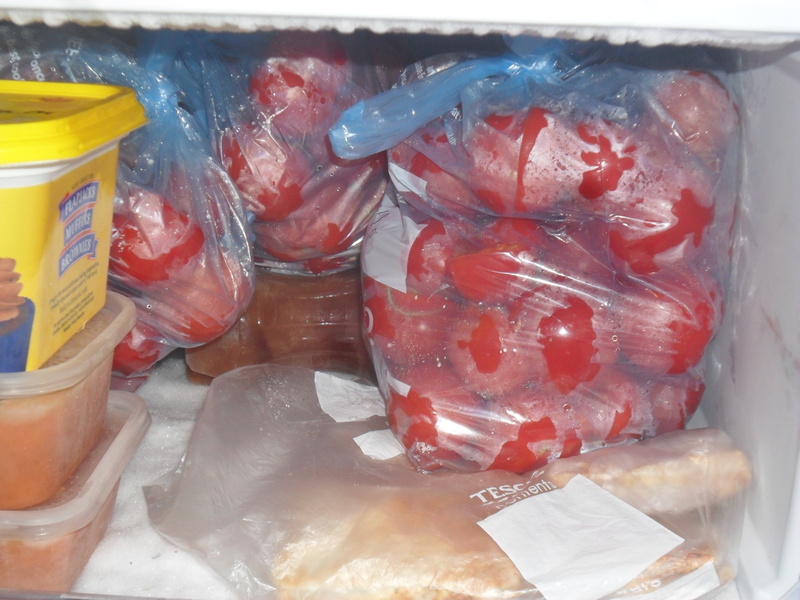 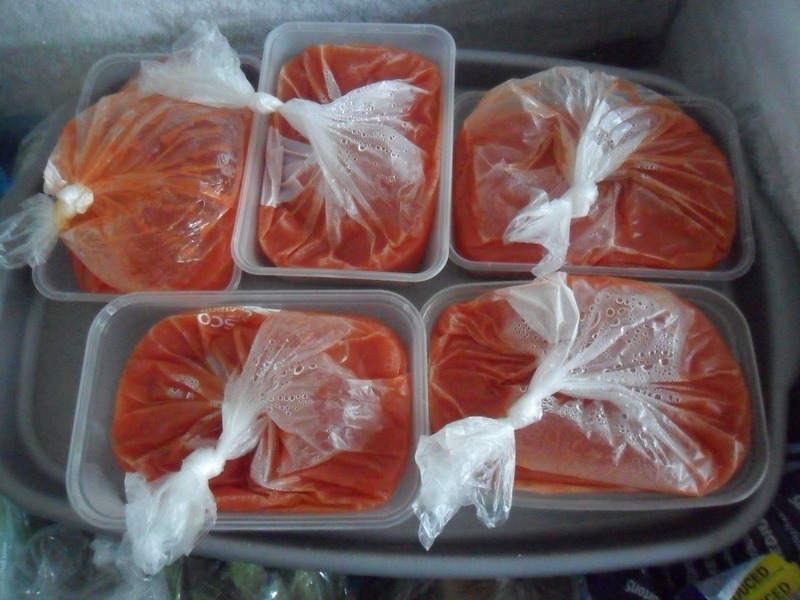 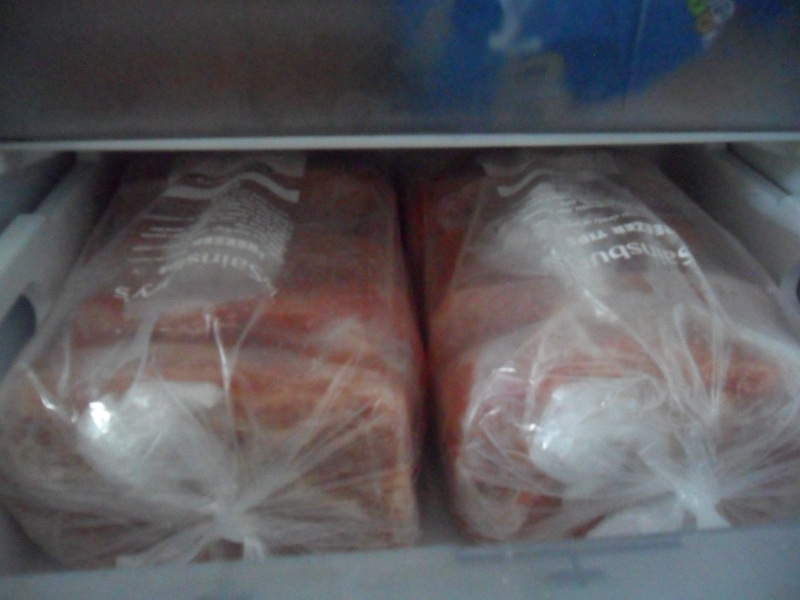 I then popped them into the freezer and I will use these to make tomato soup in the winter too. 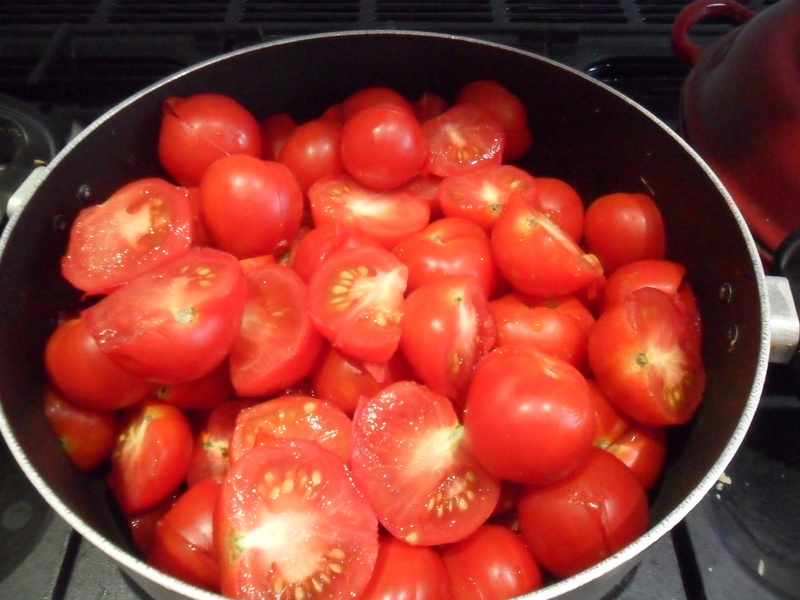 The tomatoes will turn mushy when they are defrosted, but this is fine for soup. 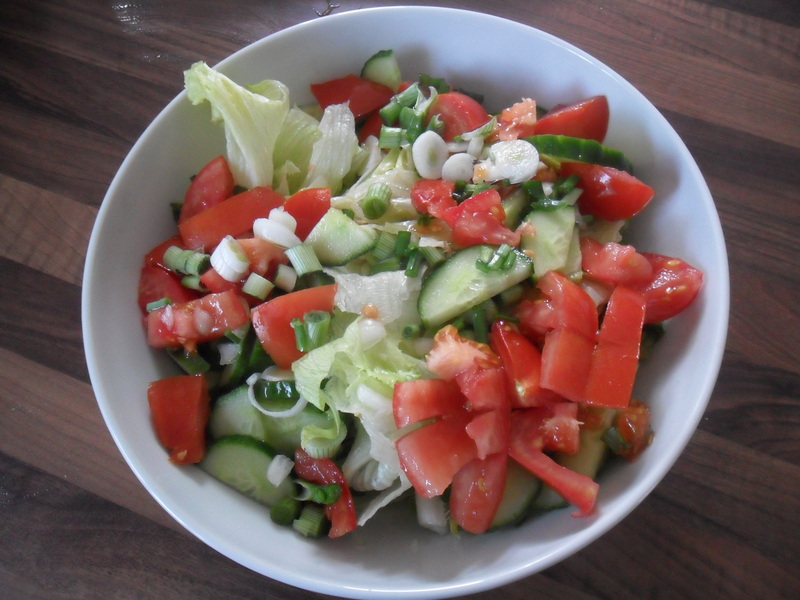 The allotment is continuing to provide vegetables and salads and I think the taste of freshly picked homegrown organic produce is far superior to supermarket produce and it’s cheaper to grow. 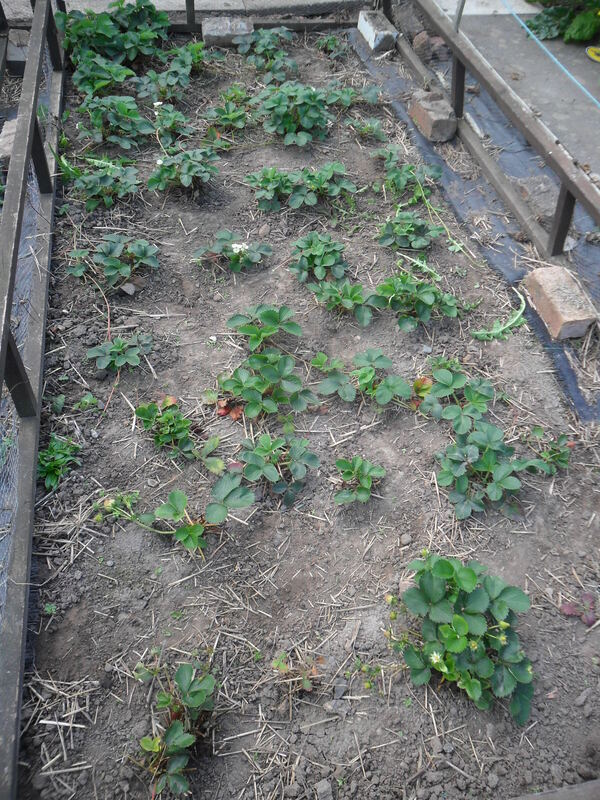 I feel very priviledged to be able to provide my family with the fruit, vegetables and salads that I grow.